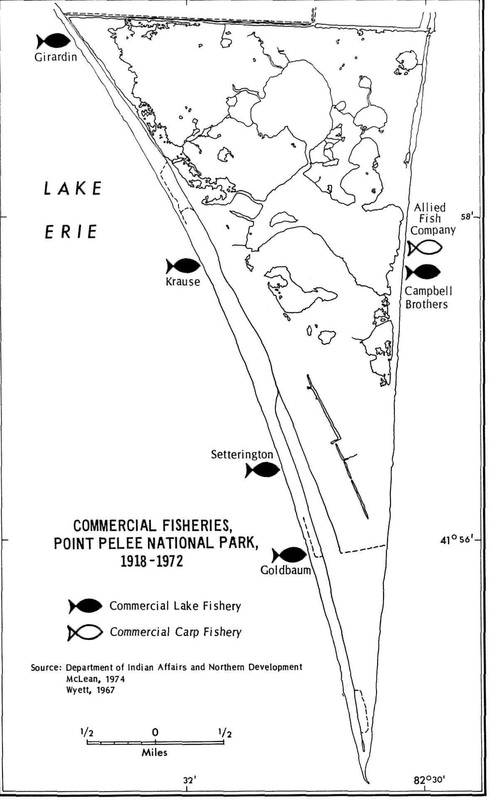 The waters around Point Pelee were well known for their abundance of fish. 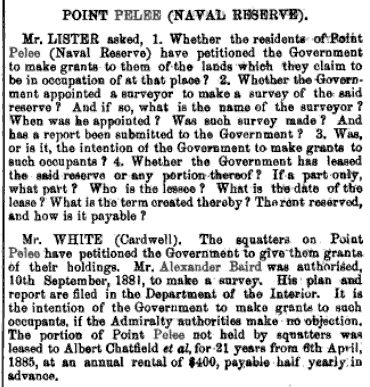 The "pointers," as the squatters came to be known, took full advantage of this. 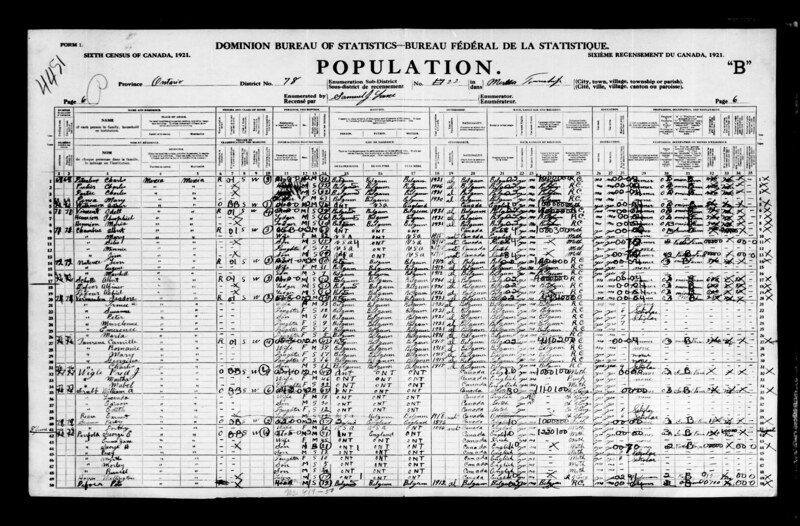 At first their catch went mostly to fill their own needs, but later they followed the example of the Americans and began commercial fishing. 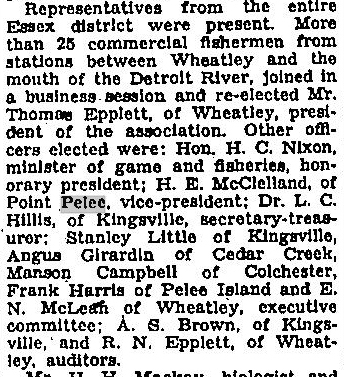 By 1891, 22 commercial fisheries were operating from the naval reserve, but many were short-lived. Ten years later, over-fishing and other environmental stresses had brought about the decline of the most marketable fish: the lake trout, whitefish, and lake herring. A gill net has attached floats along its top and weights along its bottom causing its stretched netting to stand 6- to 12-foot-high tall in a line either floating or set along the lake Erie bottom. Smaller fish swim through a netting of fine twine with openings of an approved size. Larger fish too big in their girth to swim through the netting, try to back out, but then get caught by the gills in the netting. After "pulling" the gill net to extract the fish, the fisherman either reset it, or set it in another location. 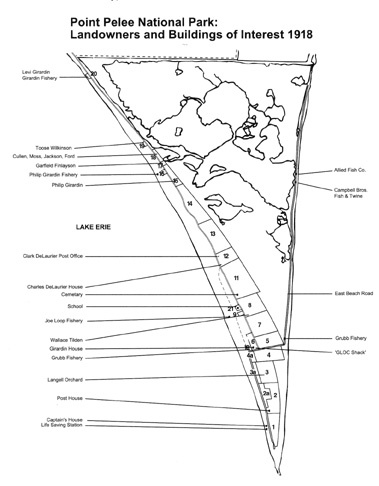 A pound net has a long lead net that hangs from floats on the surface down to the bottom of Lake Erie, and two wing nets connected to an open-top heart and "pot" or pound. Posts that stick above the water surface anchored the system in place for the fishing season. Fish swam along either side of the lead net, directing them into a narrow opening between the ends of the two wing nets. The wing nets curled inward to form a heart-shaped enclosure ("heart") that ensured that the fish moved toward a tunnel into the net's pot. An open boat was then used to float into the pound after lowering one side of the net slightly; the net then gathered into the boat, and the fish then corralled into a small area and scooped up. 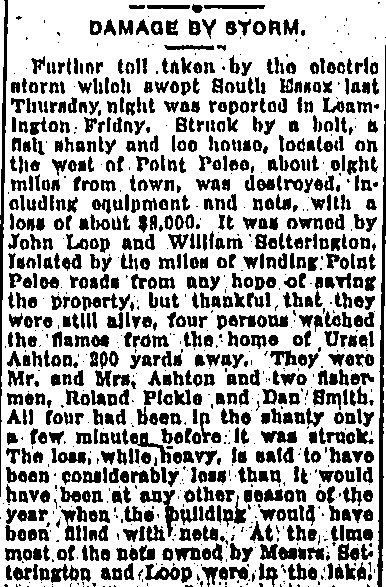 In Leamington, a note to a " flat bottom pound boat (fishing boat used for pound net fishing) then 24 feet long" was recorded in 1899. It had returned from a wood sawing bee in the country with my man-sized brothers (Herm & Aub Robson) and cousin Jack. 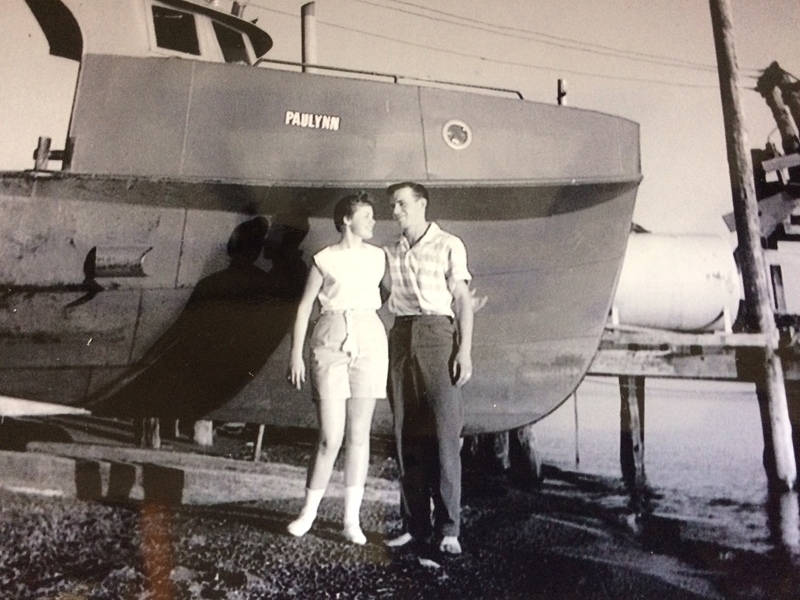 We owned a flat bottom pound boat (fishing boat used for pound net fishing) then 24 feet long. We called her "The Daisy" and a daisy she was - single cat rig, tight set to the sea, fat and quick on the tiller as a gull on the wing. The toast of our shores was our Daisy - she and the two men who sailed her, Jack and Herm. It took precious time to unstow the Daisy's winter stored canvas and fit out the stripped craft ... Her great sail reefed and set, the Daisy slipped into the winter water, With a free sheet she swept out and away, like something frightened. A tarred trap net likewise had a long lead net, a heart, and a tunnel leading into a pot that was later "lifted" to bring the fish to the surface. Submerged however was the heart, tunnel, and pot, and floats and anchors replaced the poles. If necessary (few or no fish), the net(s) could be "pulled" and re-set in another location in a day or less depending upon the number moved. 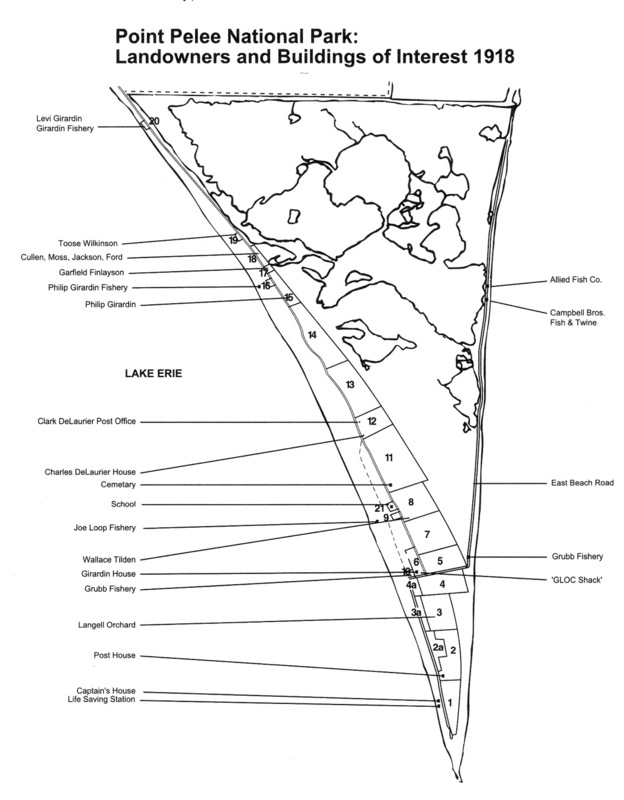 Guide to Sea Kayaking on Lakes Huron, Erie, and Ontario: The Best Day Trips ... By William Newman, Sarah Ohmann, Bill Newman, p. 132. 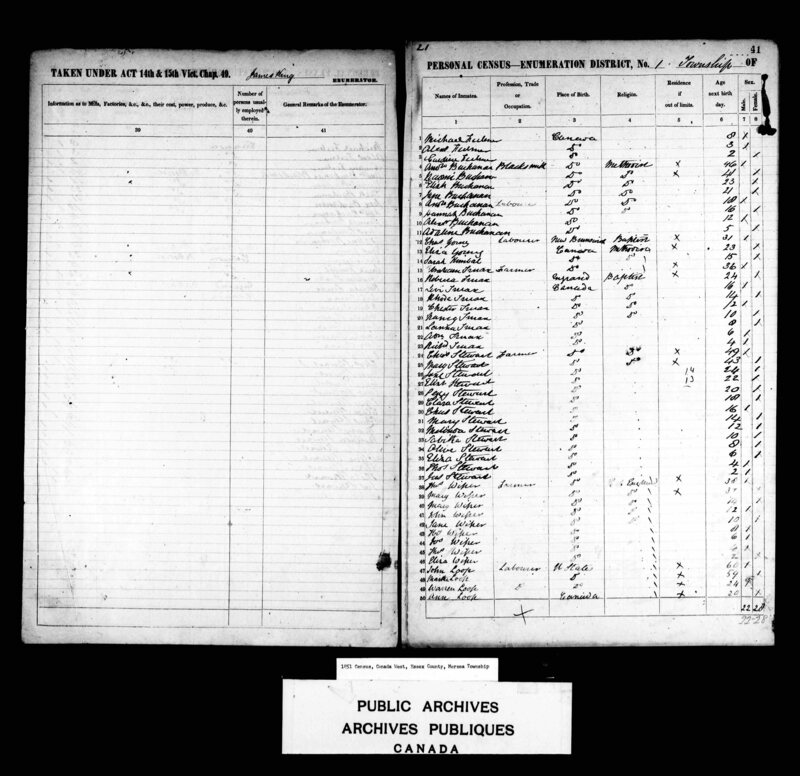 White Man's Law: Native People in Nineteenth-Century Canadian Jurisprudence By Sidney L. Harring, pp. 74-75. 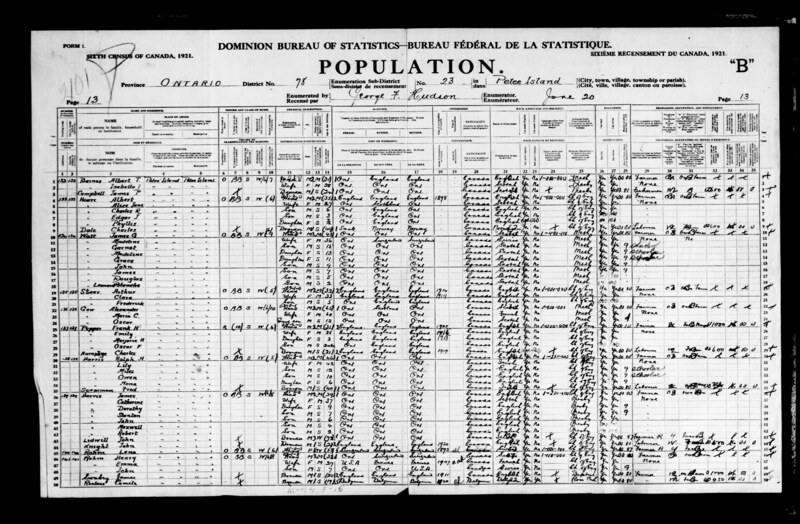 Thirteen Families in 1881, some being fishermen. 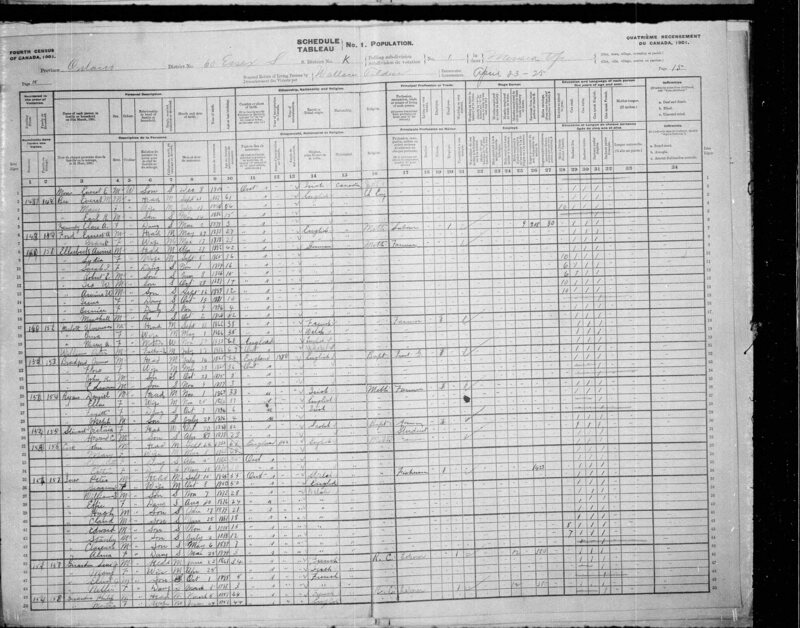 DESCRIPTION: Swan/goose hunting off the point with his brother George Maxon. Number 59, Page 38: And lastly, though not least, to the various residents on the Point whose good will and kindness made our trips, if not possible, at least comfortable ; and among these especially to Mr. Albert Gardner, whose information on various birds we have found most reliable and valuable, especially in regard to the water fowl, of which it is most difficult to gather data on short and desultory trips. Number 59, Page 50: At other times they can generally be found on the stakes of the pound nets that stretch for some distance out into the lake on both sides of the Point .. 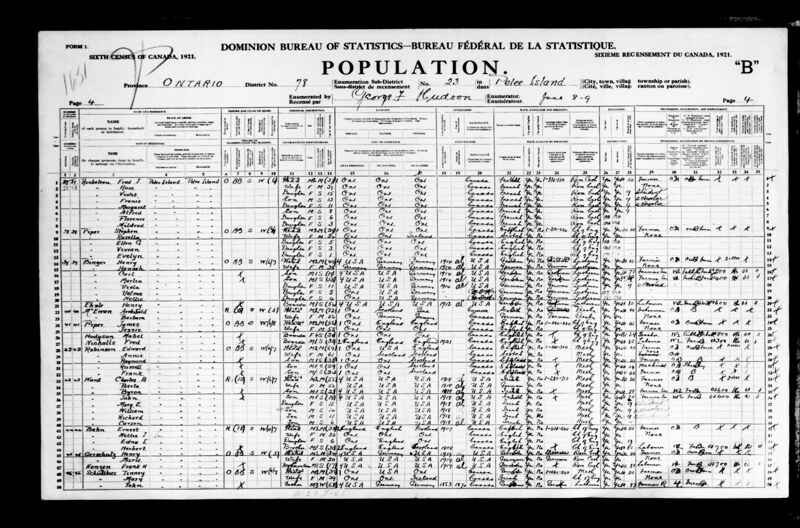 Number 60, Page 83: But it was not until Sept. 2, 1907, that we were able to remove the Night Heron from the hypothetical list when Bert Gardner brought one in that he had killed on the marsh while duck shooting. 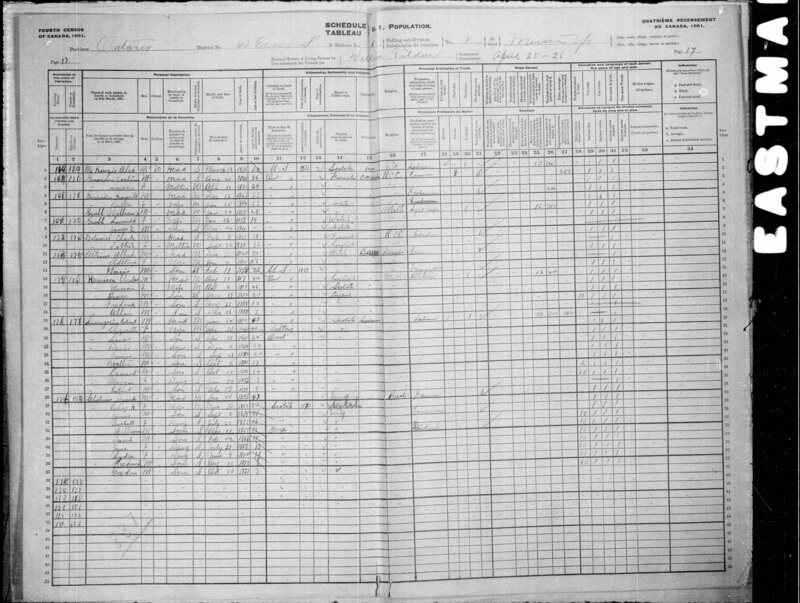 Number 63, Page 93: One of the interesting features of the fall trip of 1907 was the unprecedented number of this species [Water-Thrushes] present. 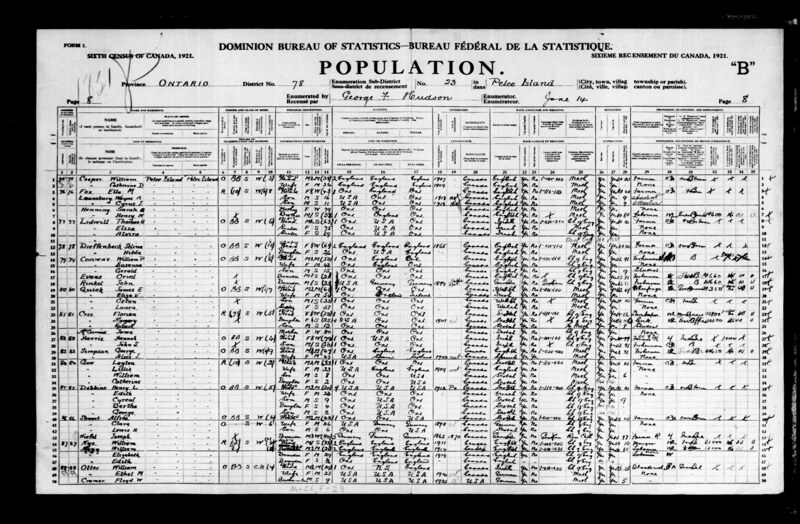 We arrived August 24, and the 26th several were noted, and the next day the species became abundant, remaining so until the 1st of September, when then; was a falling off in numbers, increasing to several the 3d and two the 4th; the species seems then to have departed. During the height of their abundance they were the most conspicuous bird on the Point, and were seen in all kinds of places, and at all times. They were in the low, damp spots in the woods, in the high walnut timber, and in the red cedar thickets. They were common everywhere. We found them in the last outlying brush pile near the end of the final sand spit, and in patches of weeds and cottonwoods along the eastern sand dune, near Grubb's fish house. 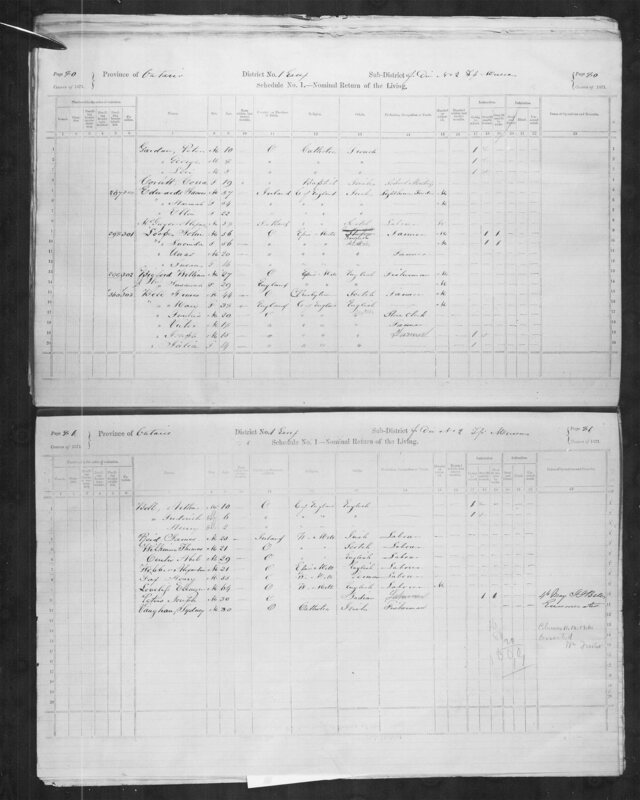 Number 64, Page 120-121: Great flocks of Swallows, Barn, Bank, Tree and Rough-winged, were congregating at the end of the Point, and the loth a flock of one hundred Martins was seen resting on the ridge of the fish house near the end of the Point. 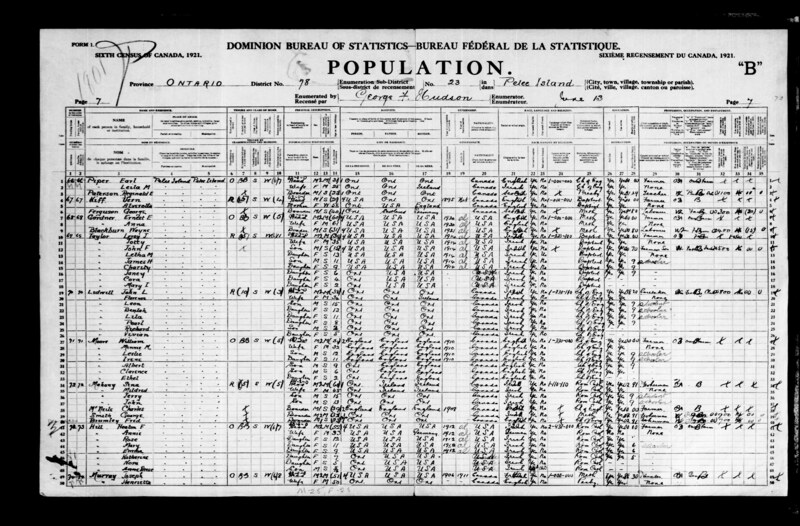 Landowners and Buildings: (20) Levi Girardin Girardin Fishery; (19) Toose Wilkinson; (18) Cullen, Moss, Jackson, Ford; (17) Garfield Finlayson; (16) Philip Girardin Fishery; (15) Philip Girardin; (12) Clark DeLaurier Post Office and Charles DeLaurier House; (11) Cemetery; (21) School; (9) Joe Loop Fishery; (8) Wallace Tilden; (6) Girardin House and 'Gloc House'; (10) Grubb Fishery; (3) Langell Orchard; (2) Post Office; (1) Captain's House and Life Saving Station; (East Beach Road) Grubb Fishery; (East Beach Road) Campbell Bros. Fish & Time; (East Beach Road) Allied Fish Co. 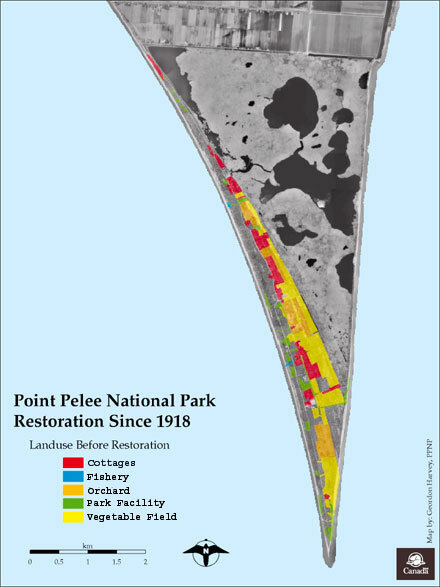 Since 1933, over 50% of Point Pelee's dryland habitat has been restored. along with 6 commercial fisheries, 20 kilometres of roads and nearly 400 buildings. 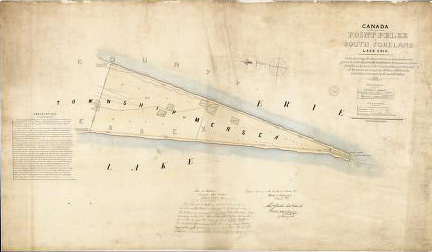 (1) http://www.pelee.com/transportation_point.asp - 1999 Map.Quest.com Inc.
... James Edwards settled and began fishing on the Point in the early 1840's His son-in-law William Grubb took over and by 1870 the Grubb fishery had expanded to include both the east and west sides of the Point. 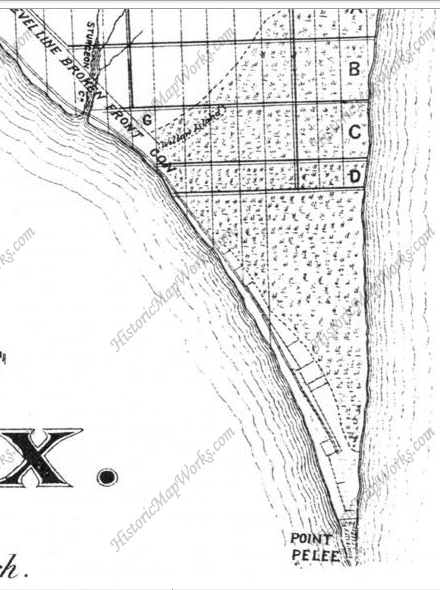 Natinsky, Young and Goldbaum fished consecutively from this site. 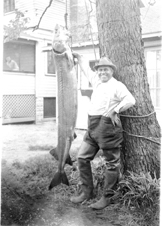 Goldbaum sold his fishing rights to Olmstead around 1957. Olmstead never used Goldbaum's buildings which were later torn down by the Park. 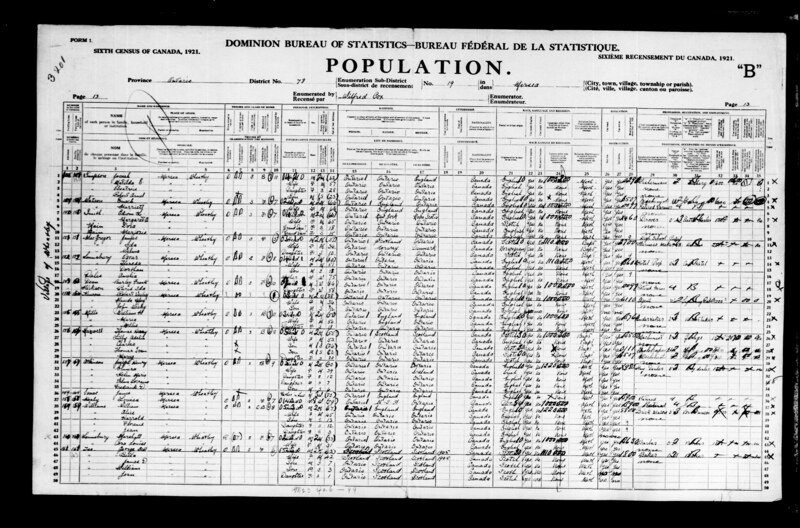 Levi Girardin established a fishery in 1911 which was eventually run by his son Elliot, better known as Pat. 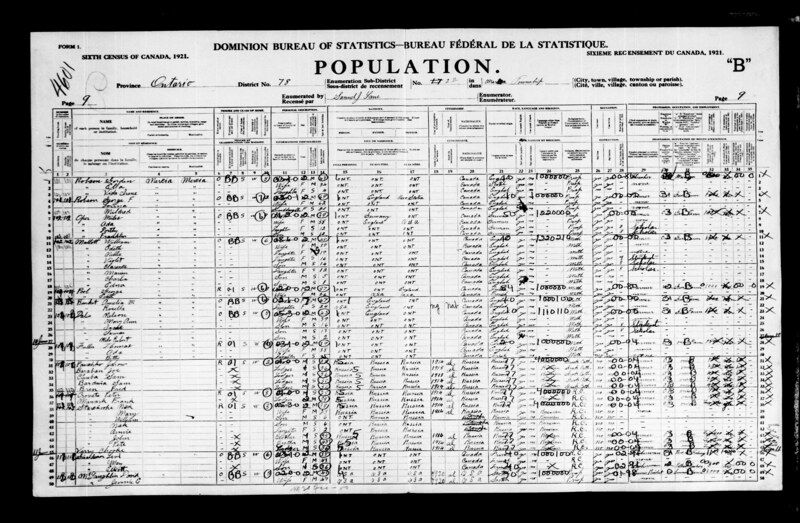 Upon the unexpected death of Pat in 1936, his wife Leita took over. 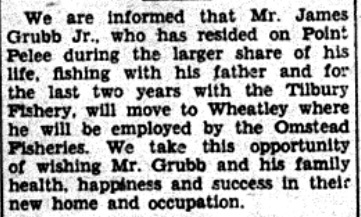 She managed the Girardin fishery until 1962 when she sold the fishing rights to Ribble and Grubb who operated north of the Parks gates until the death of Riel [Rile]Grubb in 1972. The Park removed the Girardin buildings in 1963. 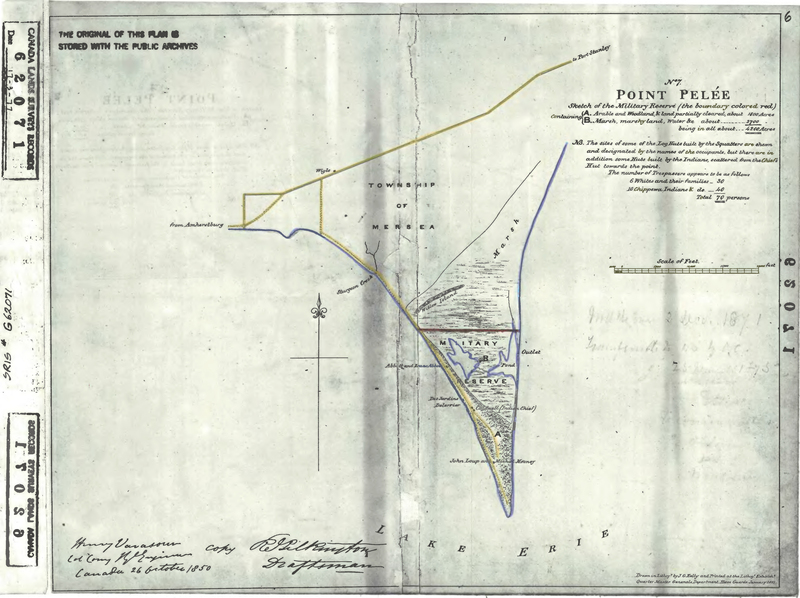 Around 1903, Philip Girardin began fishing near Lot 15. 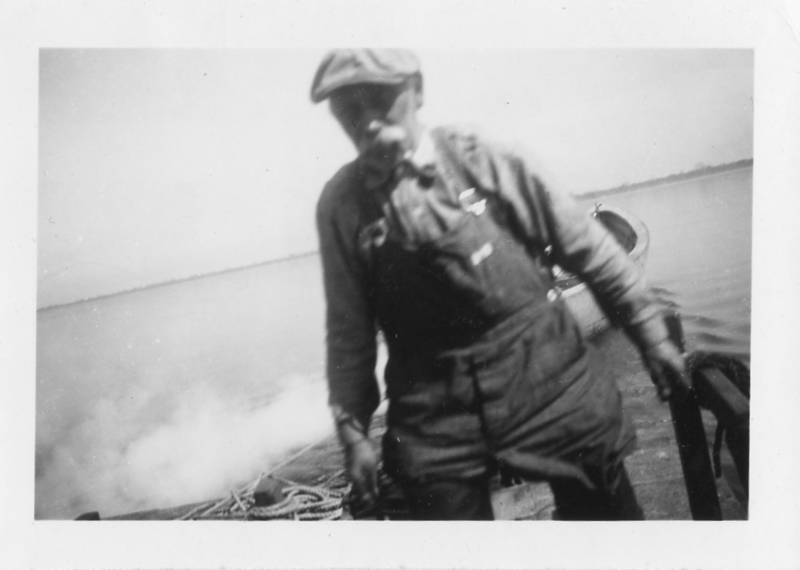 His fishing rights were sold to McLean, then McLellan and in 1937, became the basis for the Krause fishery. 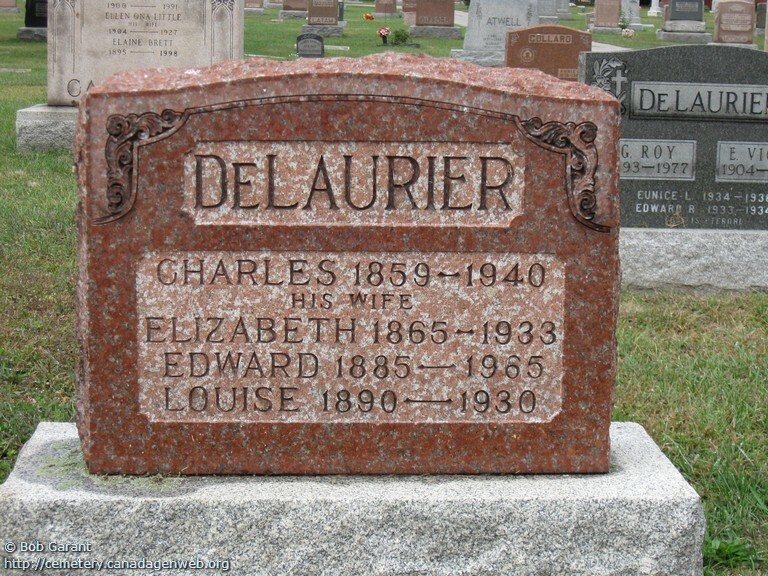 John Ellis DeLaurier, brother of Charles and son of Oliver, began a fishery in the early 1900's which after changing hands several times, was also bought by Krause. 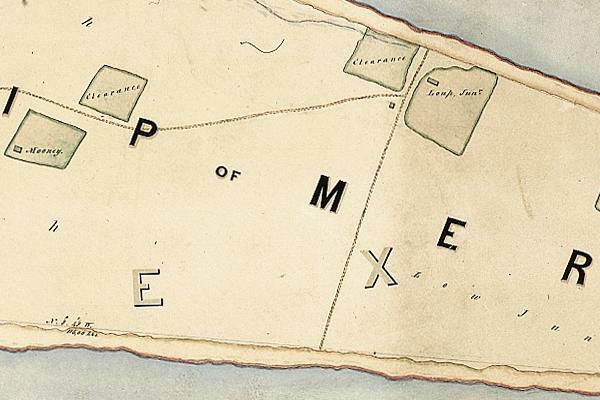 Though fishing ceased from this particular site, the buildings were not removed until 1959. 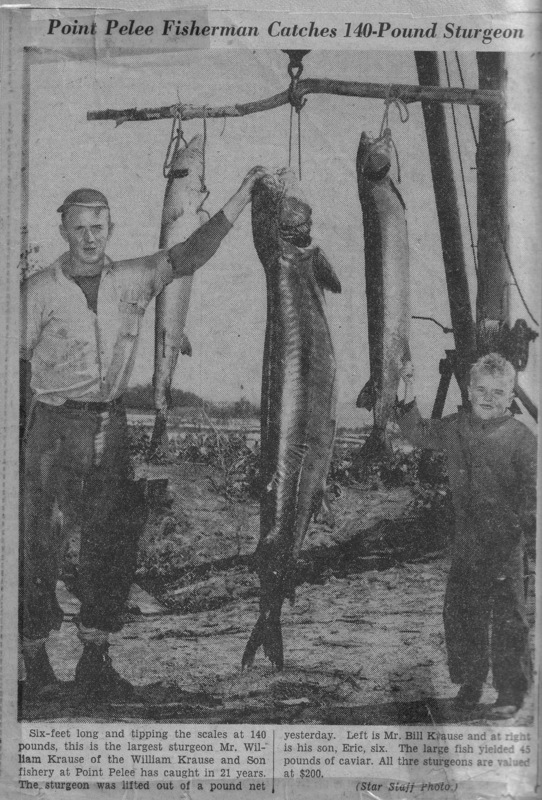 Other fisheries came and went but these three were originals which remained active until the early 1960's when Park regulations forced them to relocate. 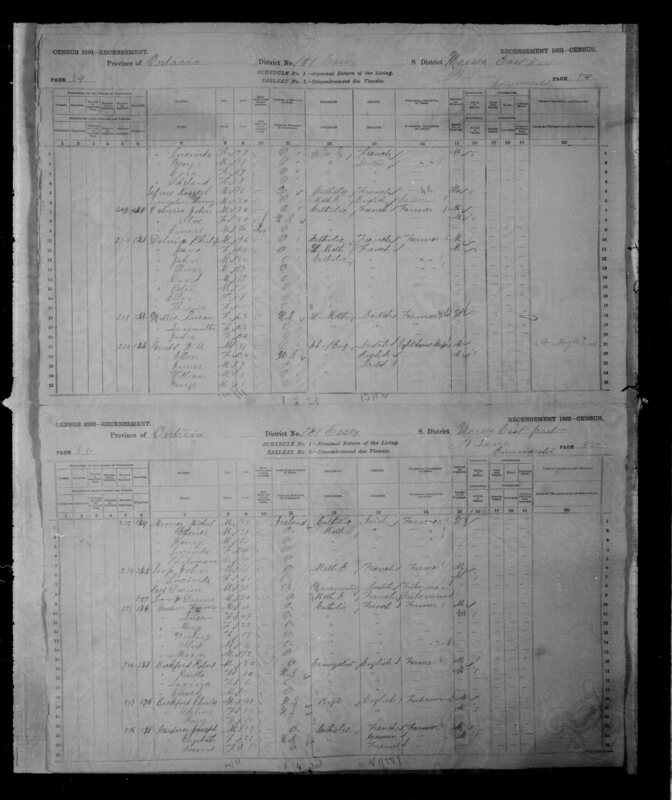 "There were many pound net fishermen at that time [when Everett H. Omstead of Wheatley was about 14 years of age]. 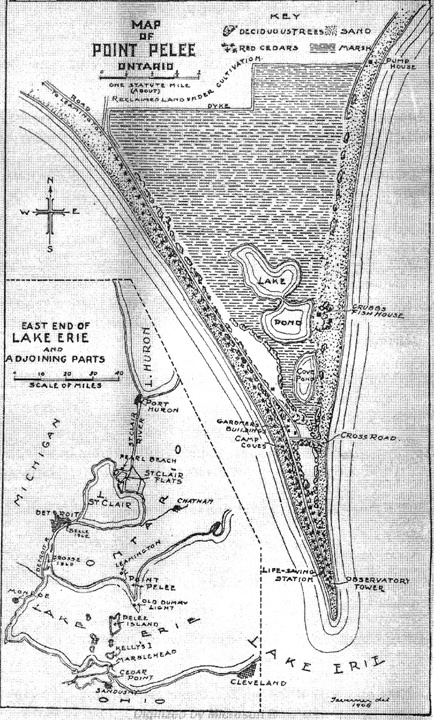 Starting from the end of the Point would be: Jimmy Grubb, McLeans', Manse Campbell, Al Long, Omsteads (of Wheatley), Bailey's, Smith and Hodgson and the Crewes' further east ..."
Located by 1918 on the east side, Lake Pond. 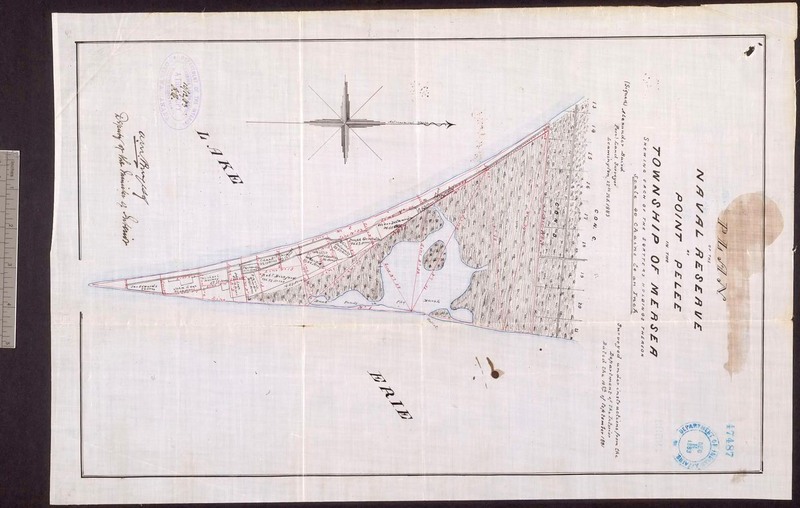 Located by 1918 on the east side, Lake Pond, to the south of the Allied Fish Co.
John Ellis DeLaurier, brother of Charles and son of Oliver, began a fishery in the early 1900's which after changing hands several times, was also bought by Krause. 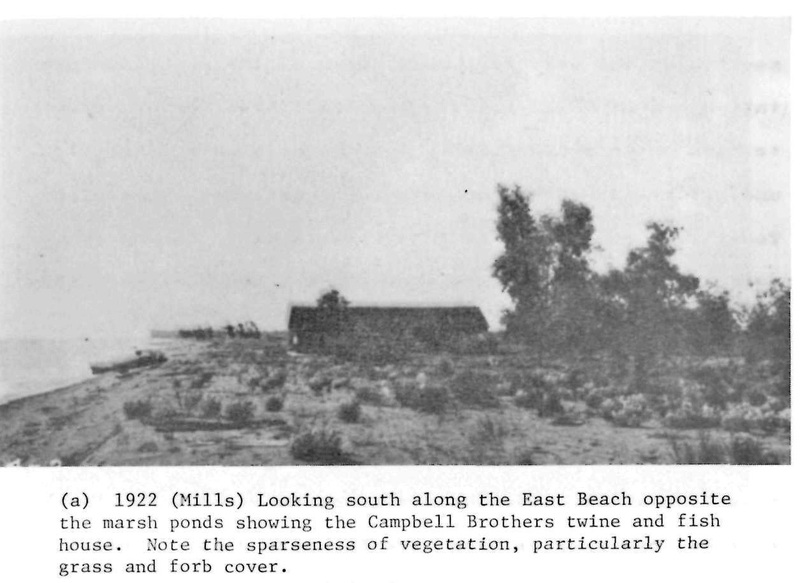 Though fishing ceased from this particular site, the buildings were not removed until 1959 - Henrietta O'Neill, In Search of a Heart (Friends of Point Pelee, 2000, pp. 45-48. 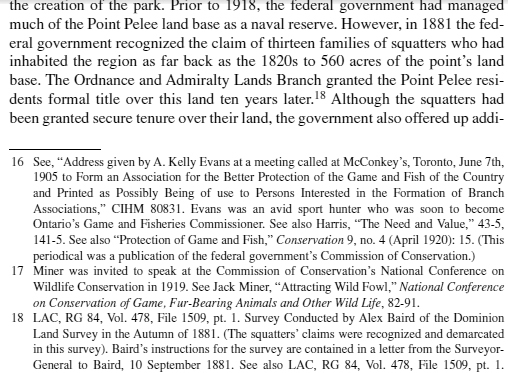 John Ellis DeLaurier started a Fishery on Lot 9 and sold it to John Loop - Henrietta O'Neill, In Search of a Heart (Friends of Point Pelee, 2000), p. 27. 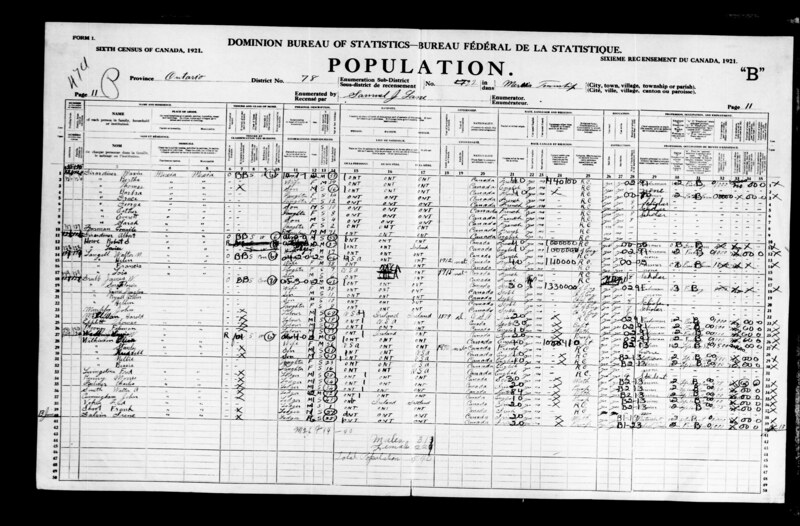 Levi Girardin established a fishery in 1911 which was eventually run by his son Elliot, better known as Pat. 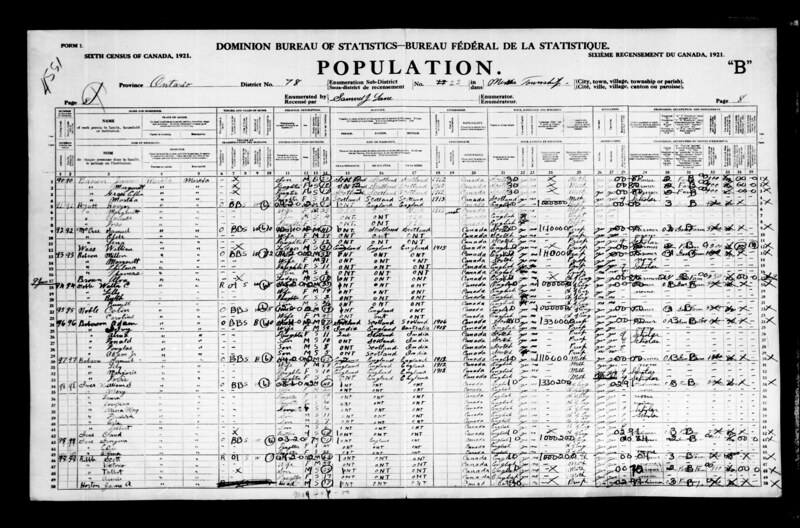 Upon the unexpected death of Pat in 1936, his wife Leita took over.- Henrietta O'Neill, In Search of a Heart (Friends of Point Pelee, 2000), pp. 45-48. 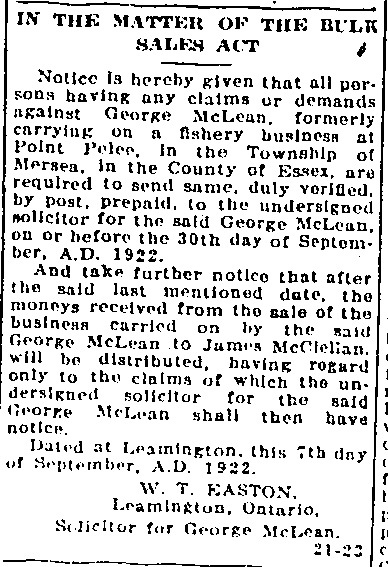 "Council accepted a request of Mrs. Leita Girardin to sell three acres of property in Point Pelee Park in two parcels ..."
hello, i am writing to you in hope that someone somewhere knows what i am talking about! I just talked to Rib and Leita Girardin was Grandma Ribbles's sister and she was a Campbell and very scotch !!! The rolling of the boat itself into the fish house to unload fish Dennis says the boat was pulled on shore on rollers and loaded onto a company truck and taken to the fishery. 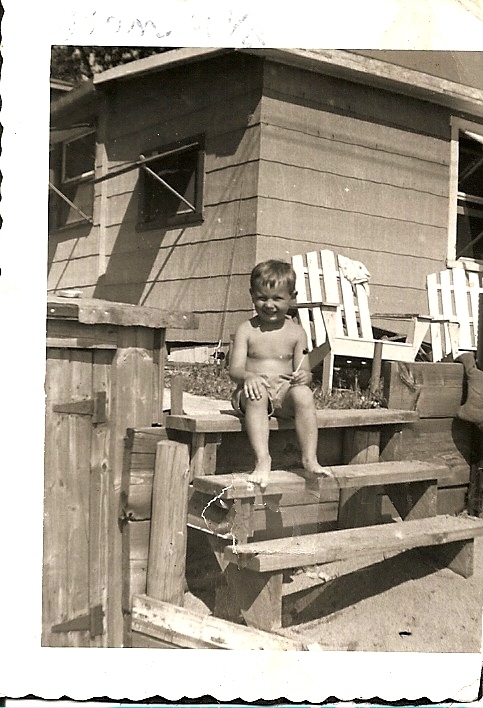 He remembers Bluebird Cottages but I am going to e-mail Carlene to see if she remembers. Den does not remember the Ives but he remembers the rest. 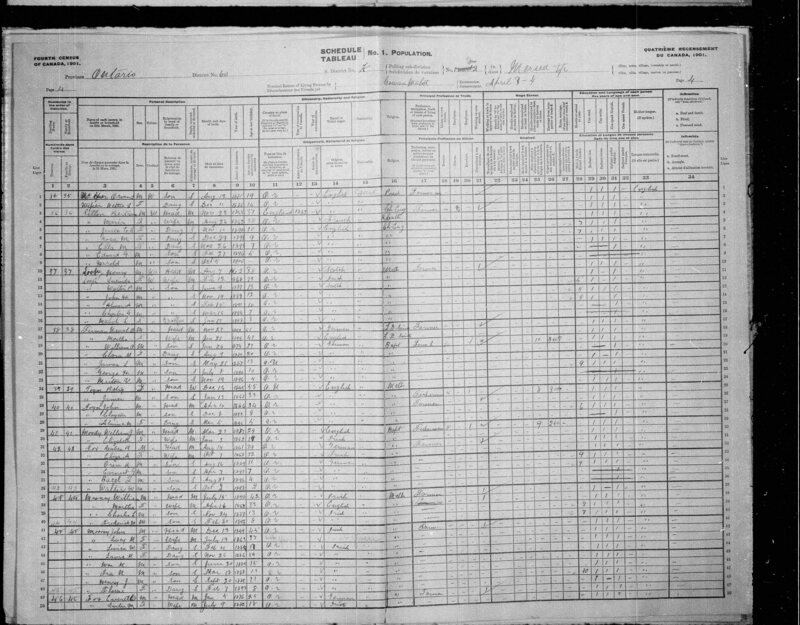 Dennis and Shirley passed this on to me, so I'll give you what I know. it as much as Dennis and Pat and Carlene. 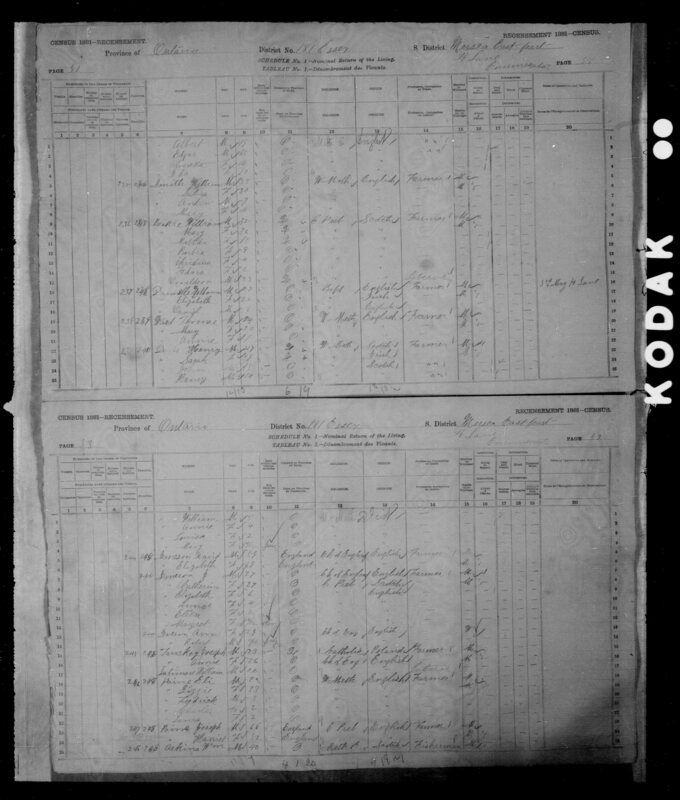 Aunt Leita's daughter is still alive and full of information if you need anything else. 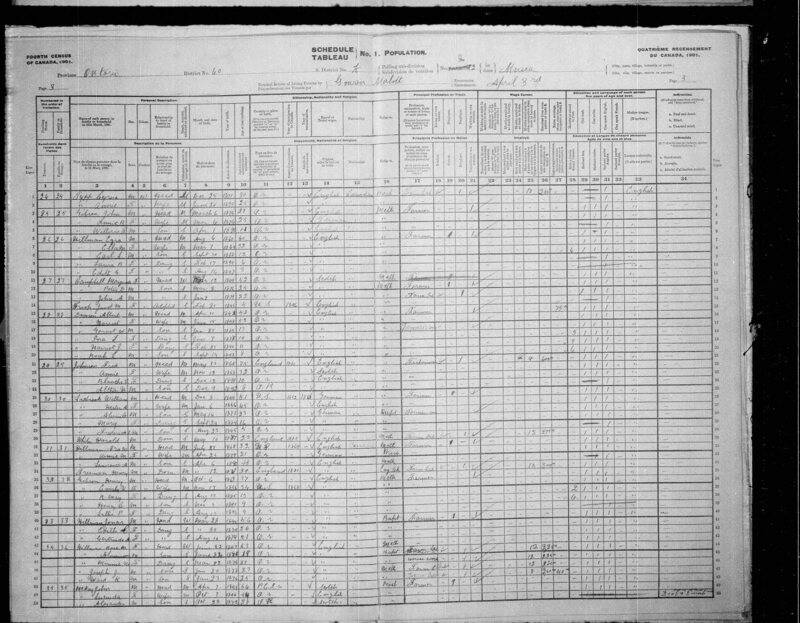 Her name is Mary Jane Barnet and her phone number is ..... She had an active role in the fishery prior to Aunt Leita's retirement and my dad's subsequent running of the business. 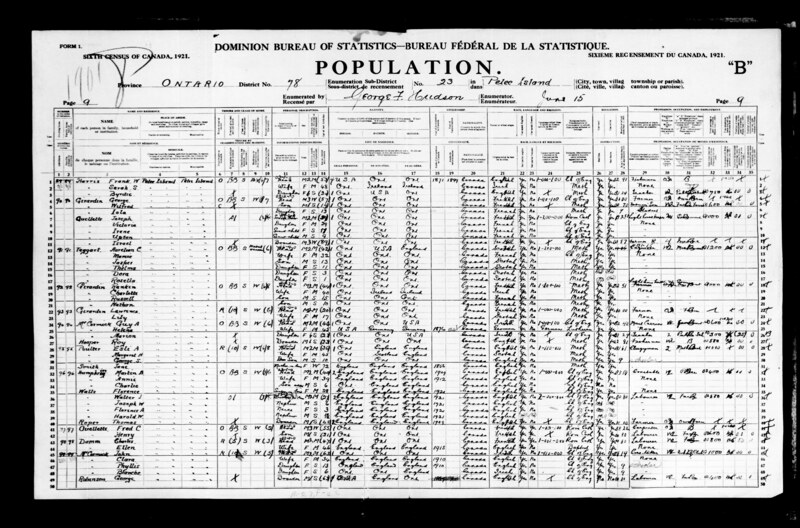 Name: Joseph A. Girardin Birth: 25 Nov 1851 - Point Pelee, Ontario, Canada; Death: 06 Jun 1941 - Leamington, Ontario, Canada OR Name: Joseph Girardin Birth: 25 Nov 1852 - Point Pelee, Ontario, Canada Death: 04 Jun 1941 - Leamington, Ontario, Canada. 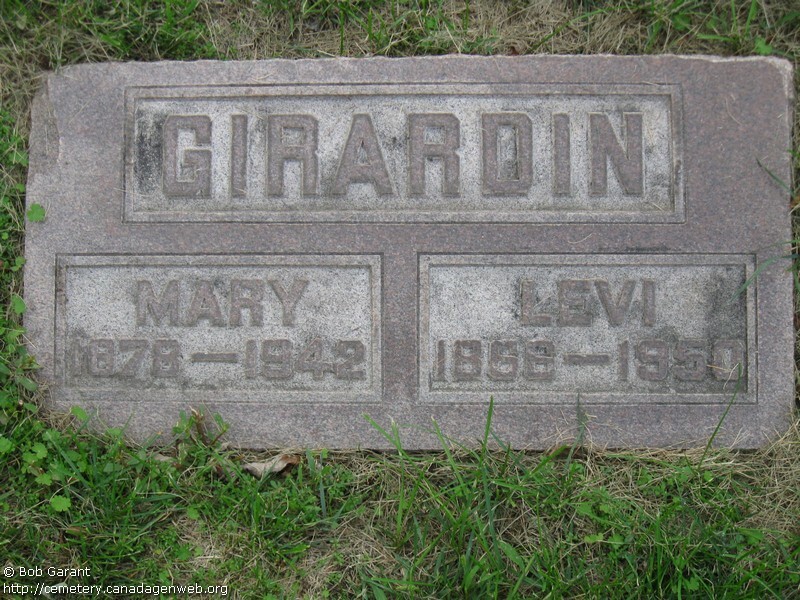 Levi Girardin established a fishery in 1911. - Henrietta O'Neill, In Search of a Heart (Friends of Point Pelee, 2000), pp. 45-48. 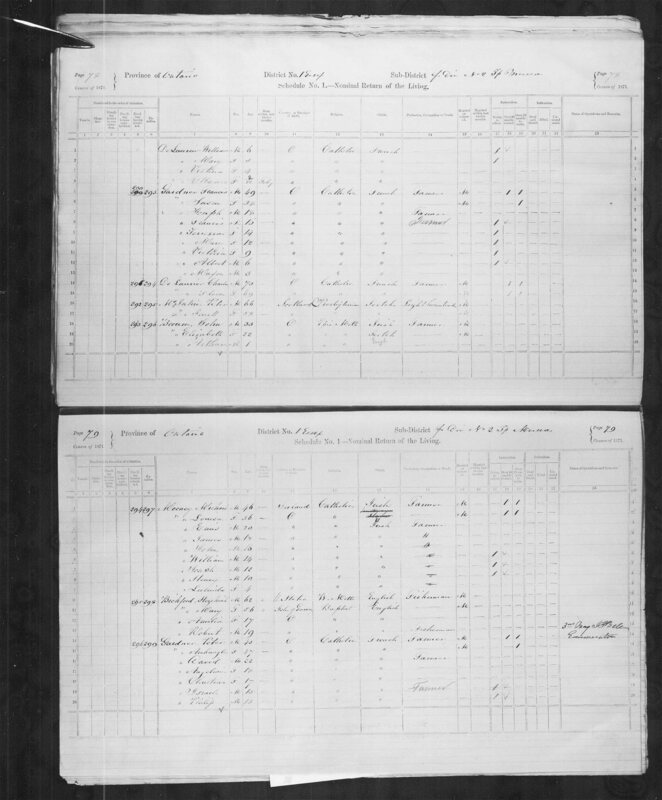 Levi Girardin owns Lot 20 and runs a fishery there with his son Pat. - Henrietta O'Neill, In Search of a Heart (Friends of Point Pelee, 2000), p 28. 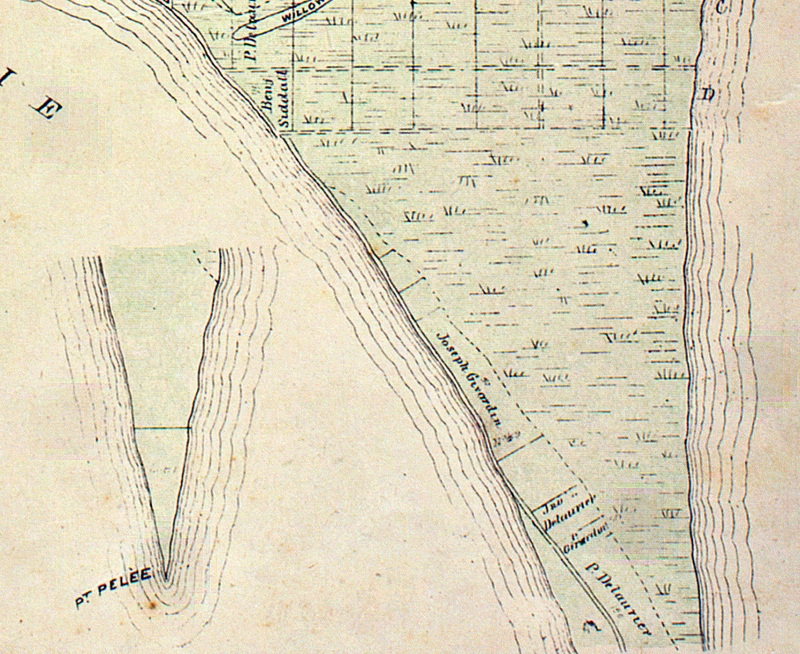 Around 1903, Philip Girardin began fishing near Lot 15. 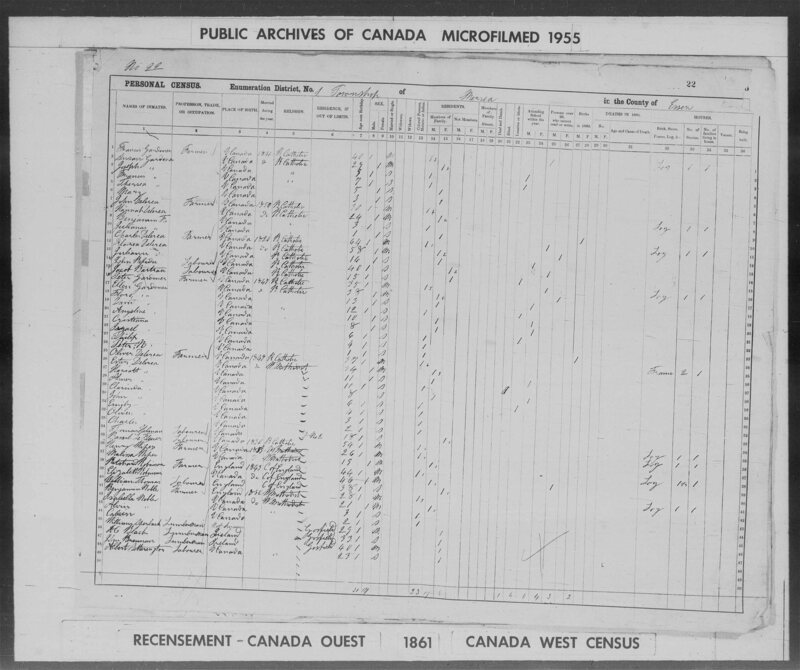 Geological Survey of Canada, The Survey, Memoir, Issue 54, 1914, p. 37. [Henrietta O'Neill, In Search of a Heart (Friends of Point Pelee, 2000), p. 27. 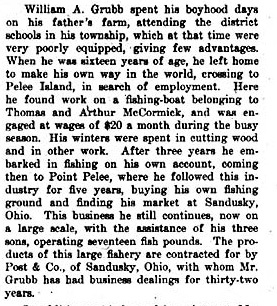 William Grubb took over and by 1870 the Grubb fishery had expanded to include both the east and west sides of the Point - Henrietta O'Neill, In Search of a Heart (Friends of Point Pelee, 2000), pp. 45-48. 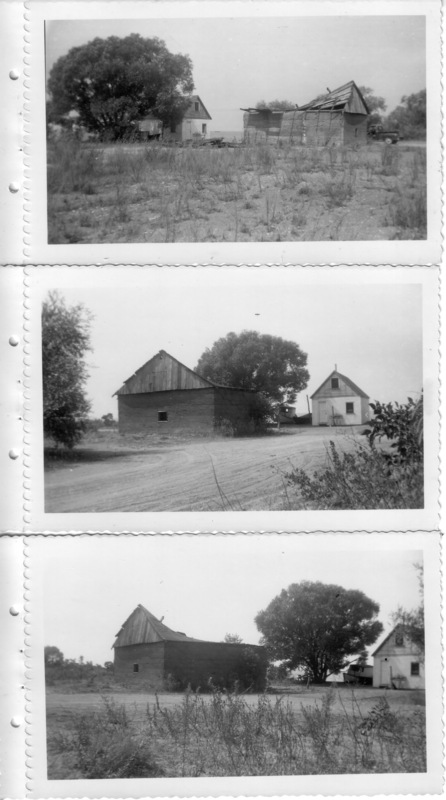 "W. A. Grubb is erecting a fine concrete block house on Point Pelee ..."
In 1937. 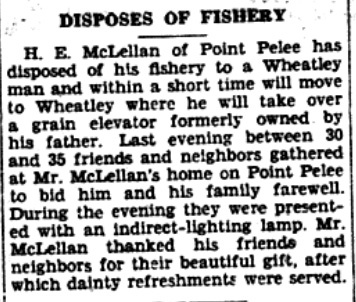 "Mac", having operated his own fishery for a number of years, sold his business to William Krause of Point Pelee, and moved to Wheatley to operate a feed mill and coal business. 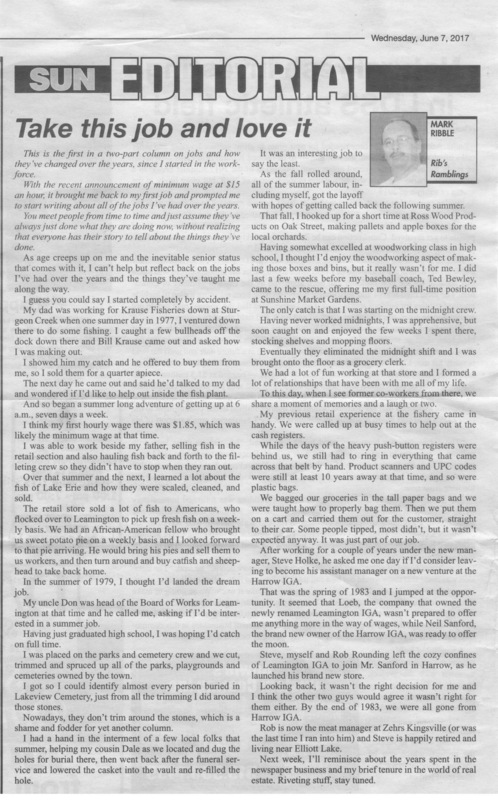 Karl Rudy Krause recalls that the his father first purchased the license of McLellan and then further north that of Sid Tilbury where they operated their Fishery until 1969. 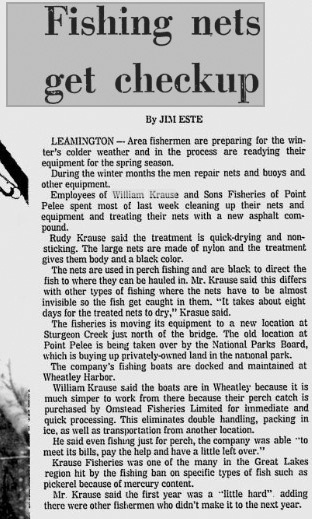 At first, the Krauses - William, and sons Bill and Rudy- fished using pound net technology. Here, at the beginning of the season, using a pile driver, they drove stakes into the lake bottom. They then suspended lines and nets from them. The fish caught were of higher quality than those (often dead or even rotting) caught in gill nets, as they were kept alive in the "pound" of the net. 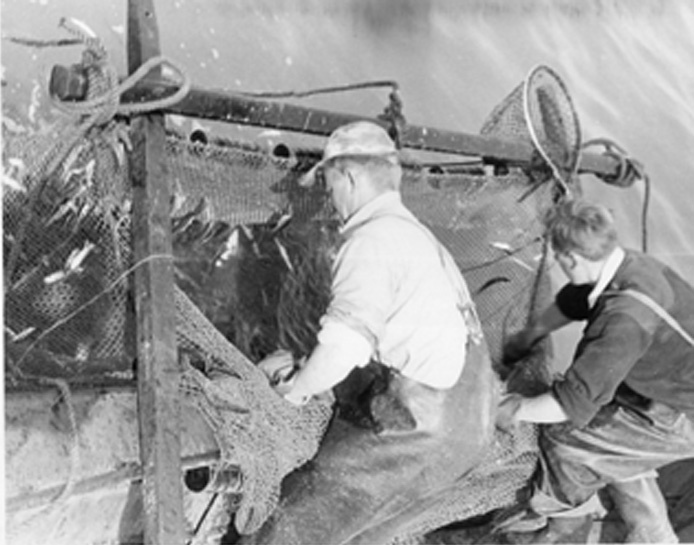 When they emptied the pound using hand dip nets, they immediately placed the live fish on ice. 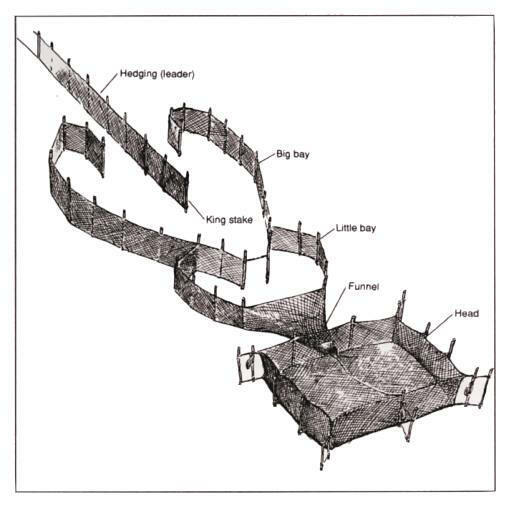 In the 1950's the Krauses adopted a trap net technology (deploying anchors rather than stakes) using nets of another's design. Increasingly, they employed traps which Bill Krause refined through redesign and trial and error. These traps proved superior to any others in catching and holding superiority. Bill also experimented with many treatments to increase netting longevity. 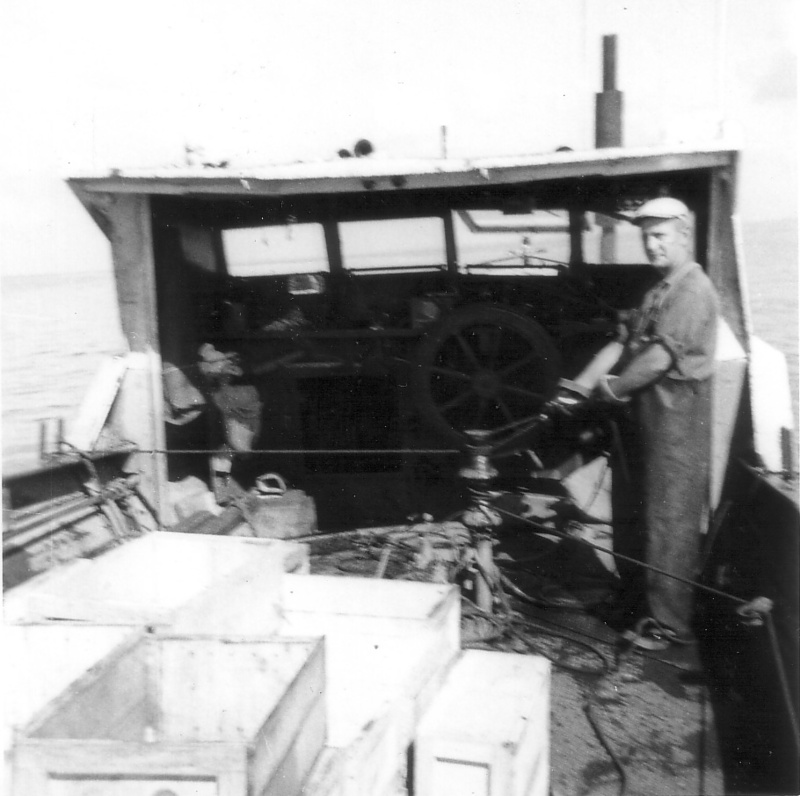 Although others turned to trap nets for mainly catching smelt, the Krauses proved that their nets could trap any fish in great quantities. 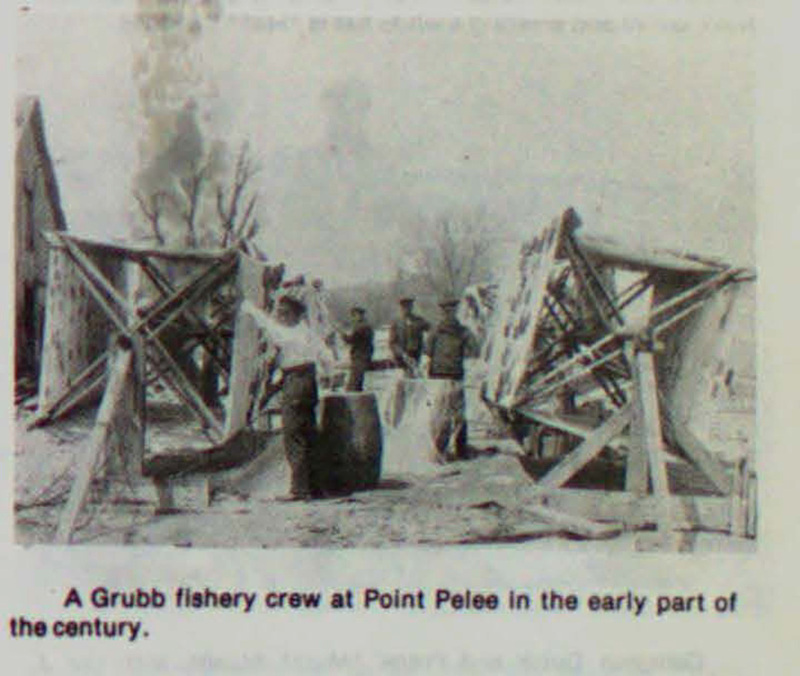 "In 1948, following a poor fishing season, the more mobile trap net came into increased usage on Point Pelee. The utilisation of the trap net also reduced the amount of shoreline area required by each fishery for equipment storage and repair. 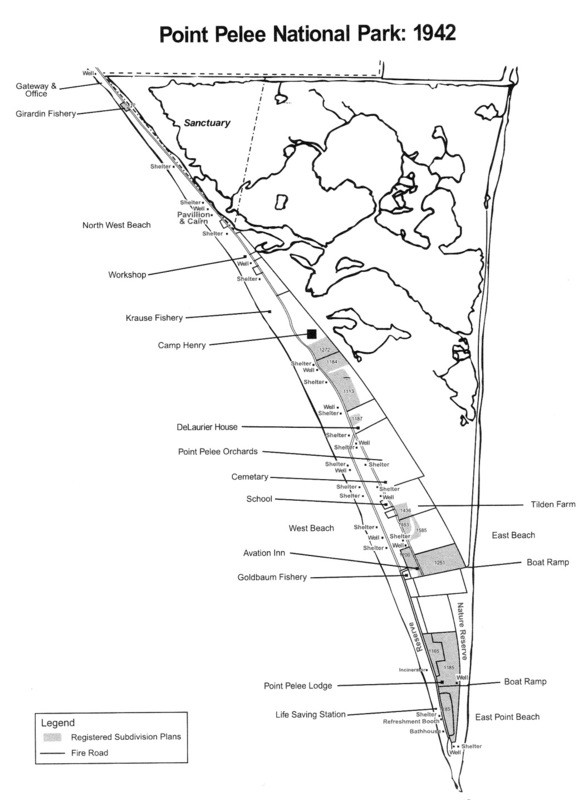 For example, the shoreline area used by the Krause fishery dropped from 1,000 feet to some 350 feet .... " [...R. Krause, Personal Communication. (July 23, 1974); Attorney General of Canada v. Krause. O.W.N. 830 ...]"
Bill Krause also experimented with "trawling" with a technology also of his own design. Wooden planks called otter doors helped to keep the mouth of the net open while being towed behind the boat. Though trawling also proved successful, it nevertheless was inferior to trap netting, and the Krauses quickly dropped its use. 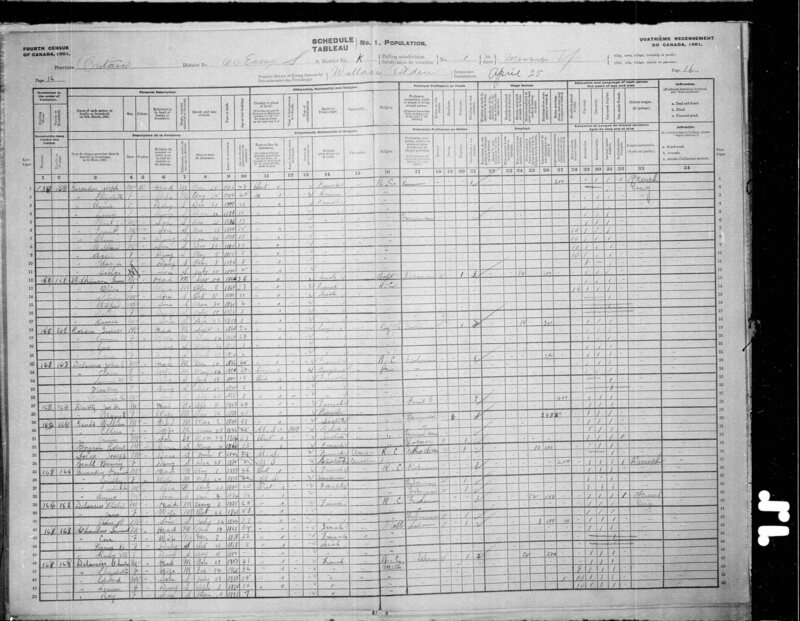 The Krause sons also built a number of steel trap boats, of great power, of their own design, with, on board, technology current to the period. 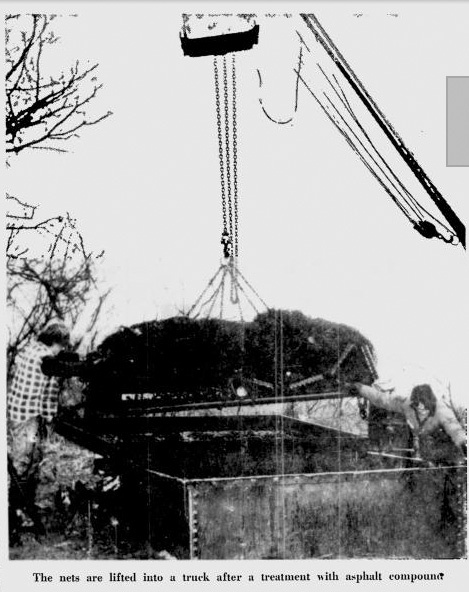 Bill Krause, 1967, lifting the trap pot of the trap net to the surface. The boxes of ice are out of sight. http://static.panoramio.com/photos/original/687829.jpg - Photo by Rein Nomm - After a severe storm with the Krause Fisheries dock destroyed. for power washing the nets reeled off the boat onto a truck on the dock. 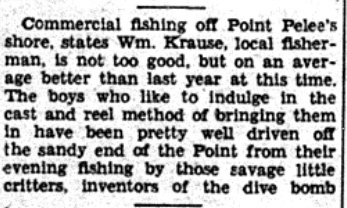 Bill Krause also invented a mechanical fish filleting machine which, though often finicky, was a wonder to behold and be heard in operation. 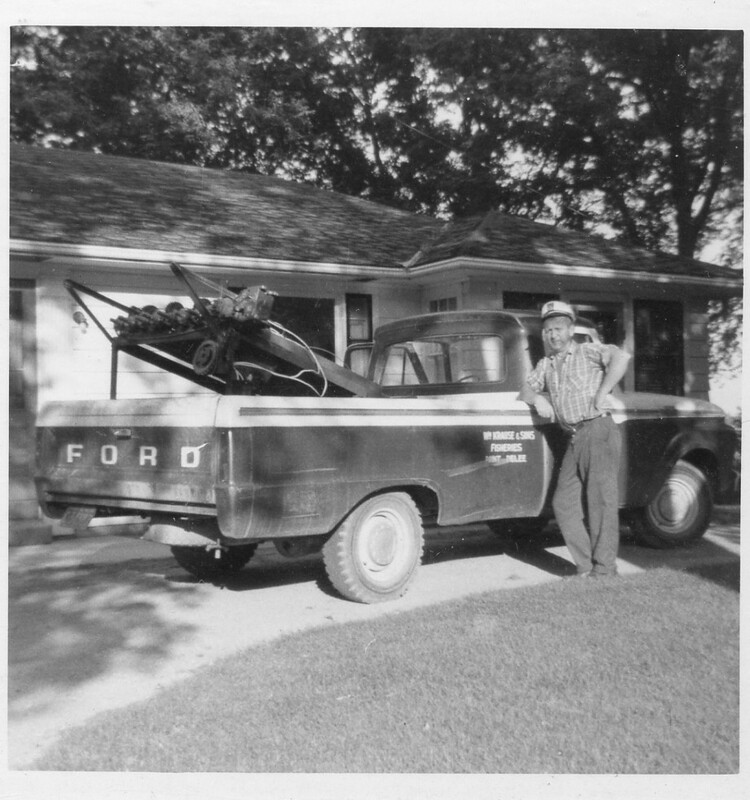 H. William (Bill) Krause and a part of the said machine in the back of the truck. Fresh sturgeon steak, and salted black caviar produced by the hands of my father - nothing tasted better except for the mounds of fried - lightly battered - trap-net perch that my mother slaved over the stove for us growing boys! That is, when we weren't wolfing down fried-in-butter cottage cheese verenike by the dozen. Great Lakes fishermen using new compound to treat nets Employees of Wm. Krause & Sons Fisheries, of Point Pelee, are reported preparing their nets for the Spring fishery by treating them with a new asphalt compound. Rudy Krause said the treatment is quick-drying and non-sticking. The nets are made of nylon and the treatment gives them body and a black color ...Used in perch fishing, the nets are black to direct the fish to where they can be hauled in ... Canadian fisherman & ocean science: Volume 58, 1981, Issues 1-4, "Facts on Fish" — Fisheries Association of BC) 4, p. 19. Gill Nets: I don't know why, but these are dominant on the Lakes. The mesh diameter is set for a certain species based on size and traps any fish attempting to pass through by the gills and kills it. Smaller fish can't get through, nor can bigger ones. Fish of a specific size are seized by the gills and die. I have a big problem with this as the net guage [sic] is not species specific. All manner of game fish and fish with no market value are trapped, killed and tossed back to waste. Also, the fish may sit dead for some time till they're harvested. Trap Nets: This is a maze arrangement where the fish swim up a "hallway" and are later scooped out live. I don't know how many trap netters are left, but if you find one, love him. 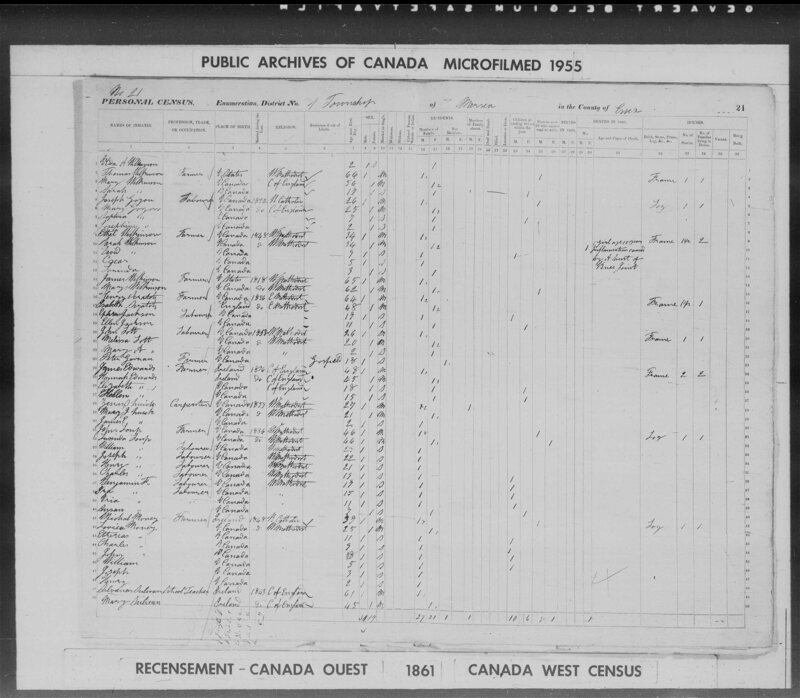 The last ones I knew of were Krause Fisheries in Leamington and Lidddels out of Pelee Island. Hy-Lite Powerboats Inc. was incorporated in 1995 as an independent entity associated with 734126 Ontario Limited (o/a Tug Weld Manufacturing) for the purpose of marketing a line of custom built aluminum-hull, high performance, offshore type powerboats. The fisheries is moving its equipment to a new location at Sturgeon Creek just north of the bridge. 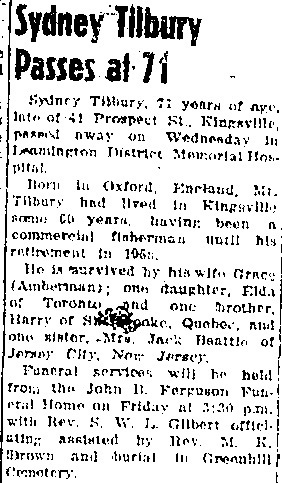 http://news.google.com/newspapers?id=W1lAAAAAIBAJ&sjid=iVIMAAAAIBAJ&pg=2907,1753546&dq=william-krause+fishery&hl=en - Windsor Star, December 28, 1971, p. 5. My dad was working for Krause Fisheries down at Surgeon Creek when one summer day in 1977, I ventured down there to do some fishing. I caught a few bullheads off the dock down there and Bill Krause came out and asked how I was making out. I showed him my catch and he offered to buy them from me, so I sold them for a quarter apiece. The next day he came out and said he'd talked to my dad and wondered if I'd like to help out inside the fish plant. And so began a summer long adventure of getting up at 6 a.m., seven days a week. I think my first hourly wage there was $1.85, which was likely the minimum wage at that time. 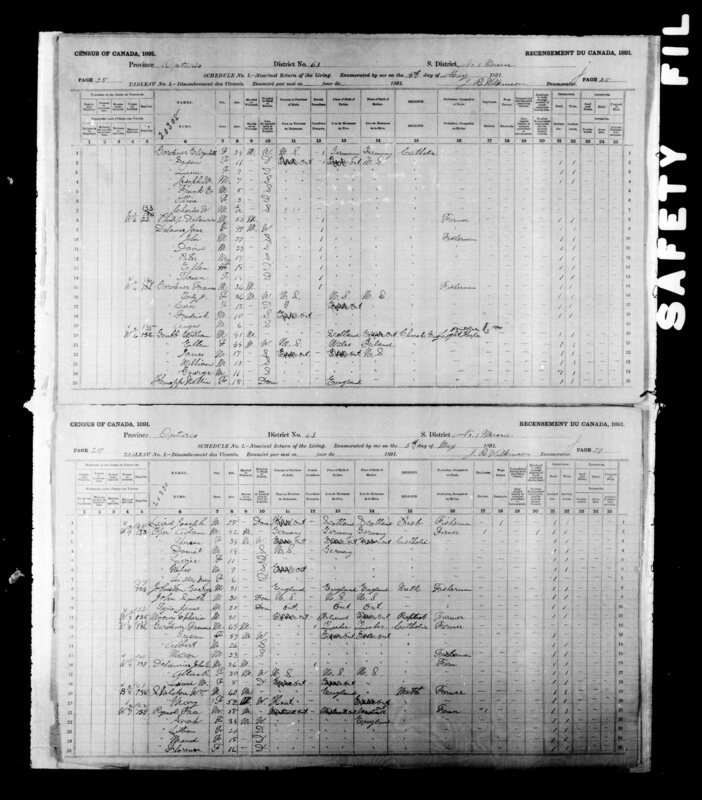 I was able to work beside my father, selling fish in the retail section and also hauling fish back and forth to the filleting crew so they didn't have to stop when they ran out. 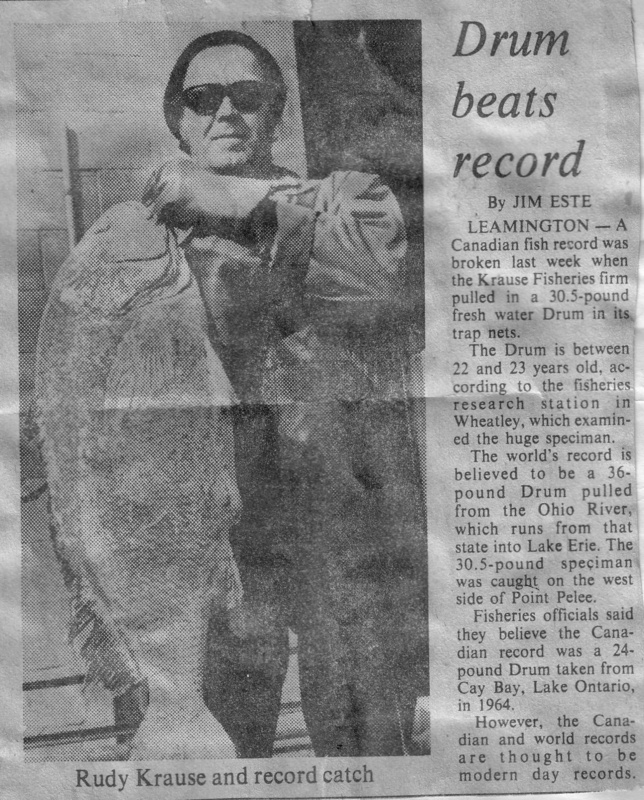 Over that summer and the next, I learned a lot about the fish of Lake Erie and how they were scaled, cleaned, and sold. The retail store sold a lot of fish to Americans, who flocked over to Leamington to pick up fresh fish on a weekly basis. We had an African-American fellow who brought us sweet potato pie on a weekly basis and I looked forward to that pie arriving. He would bring his pies and sell them to us workers, and then turn around and buy catfish and sheep- head to take back home. and to Krause Fisheries, Pt. 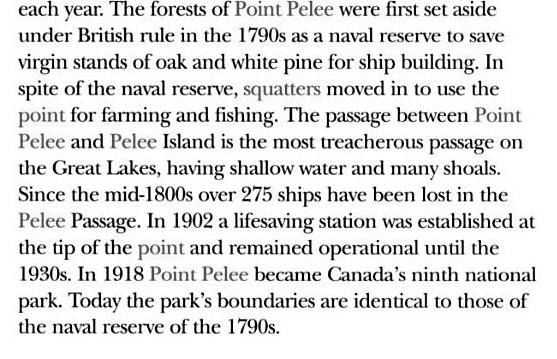 Pelee, for supplying sturgeon specimens for dissection ... p. 102. 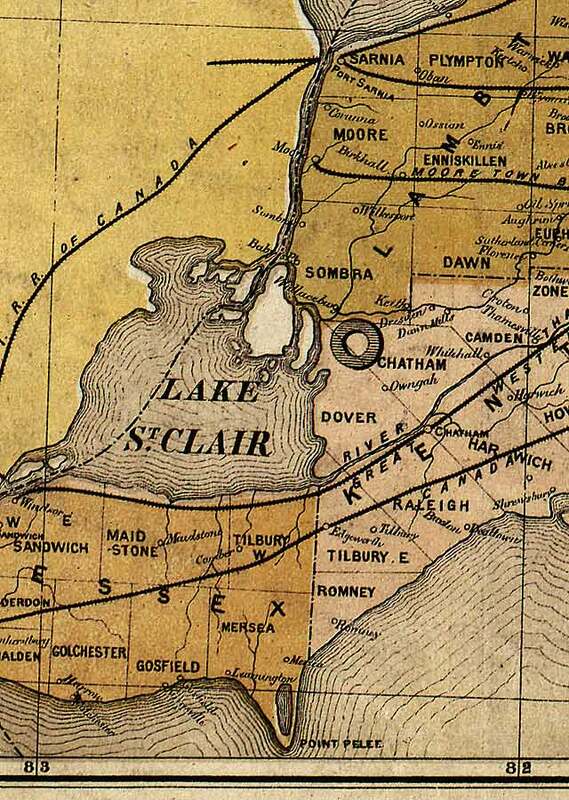 [Lake Trout] Point Pelee (41°55', 82°30') and Pelee Island (41°47', 82°40'). Rocky areas at the point and on the east side of the island may have provided limited spawning habitat (Moenig, undated) ... p. 47. [COMMON SHINER ] ... Point Pelee (41°55', 82°30'). 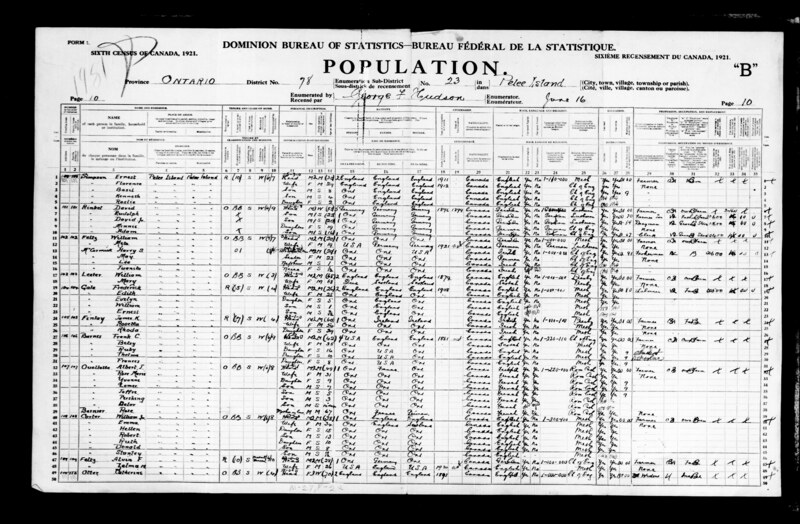 In 1929, one larva was found in the lake south of Point Pelee and east of Pelee Island (41°47', 82°40') on June 19 (Fish 1932). 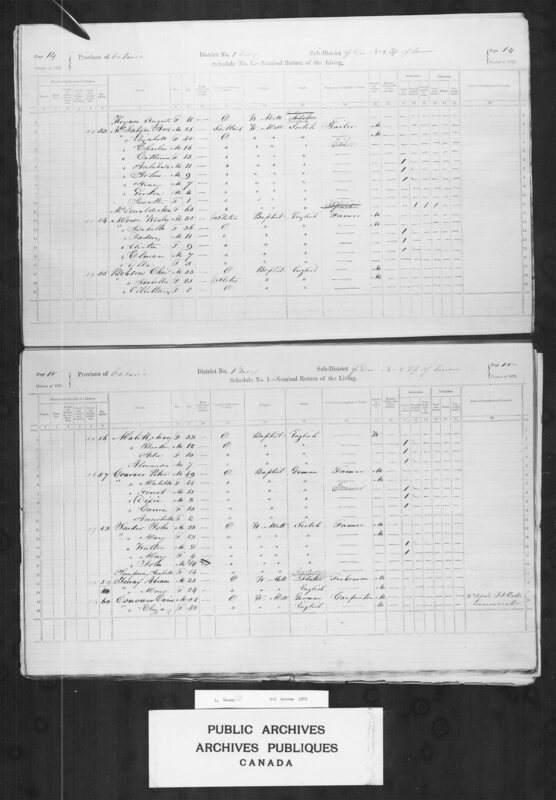 ... p. 83. [WHITE BASS] ... Point Pelee (41°55', 82°30'). 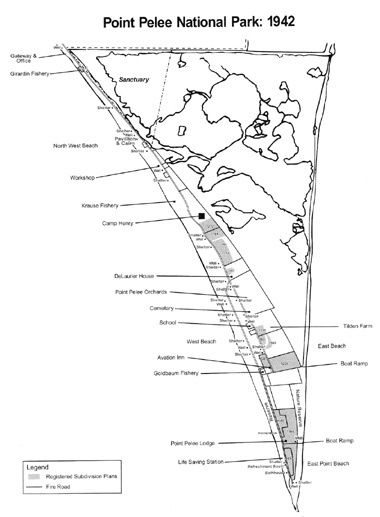 The shoals along the entire shoreline of the point are important spawning areas (Environ. Can. 1977a). 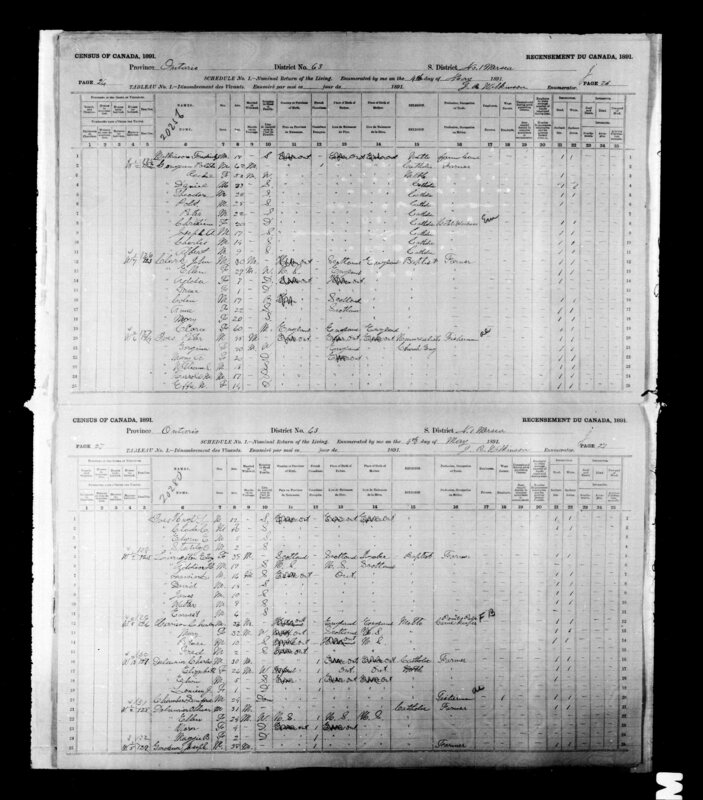 Young- of-the-year were collected on the northwest beach on the point (Paine 1976). 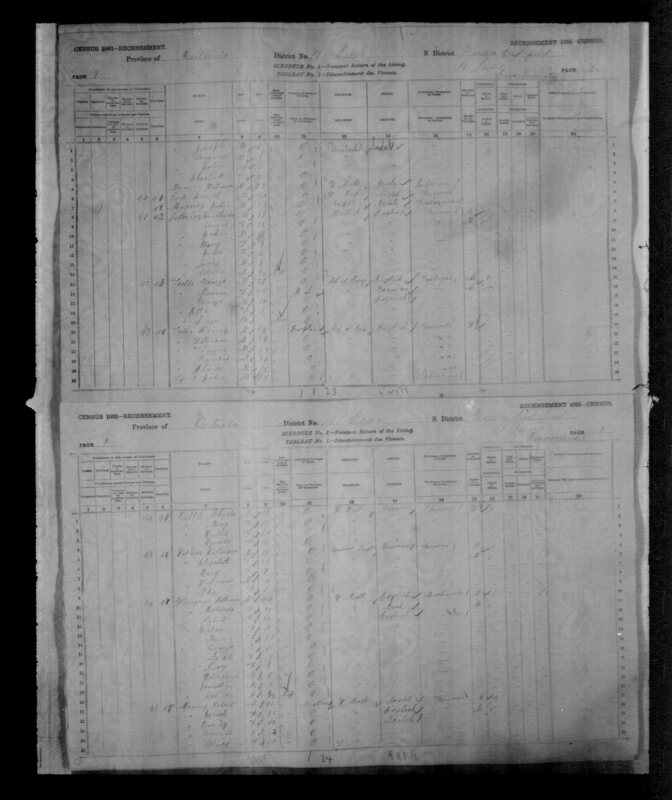 ... p. 135. [SUN FISH] ... Point Pelee (41°55', 82°30'). 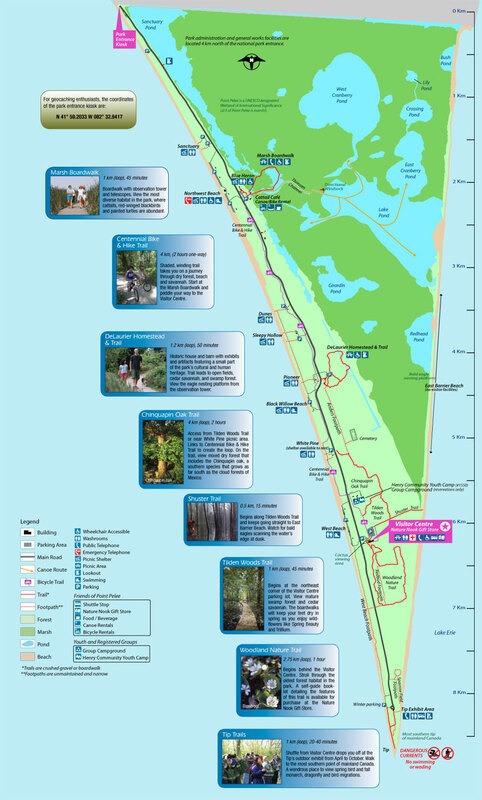 The marshes of Point Pelee National Park (41°58', 82°32') are important spawning areas (Environ. Can. 1977a). 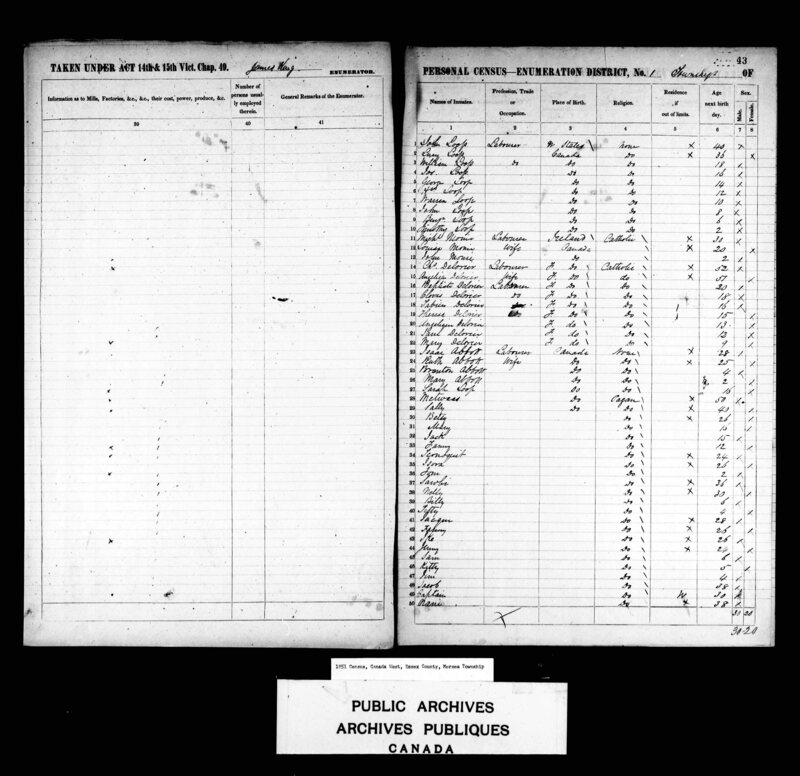 ... p. 141. [BLACK BASS] ... Point Pelee (41°55', 82°30'). 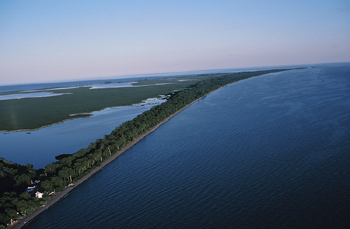 The marshes of Point Pelee National Park (41°58', 82°32') are important spawning areas (Environ. Can. 1977a). ... p. 150. [WALLEYE ] ... Point Pelee (41°55', 82°30'). 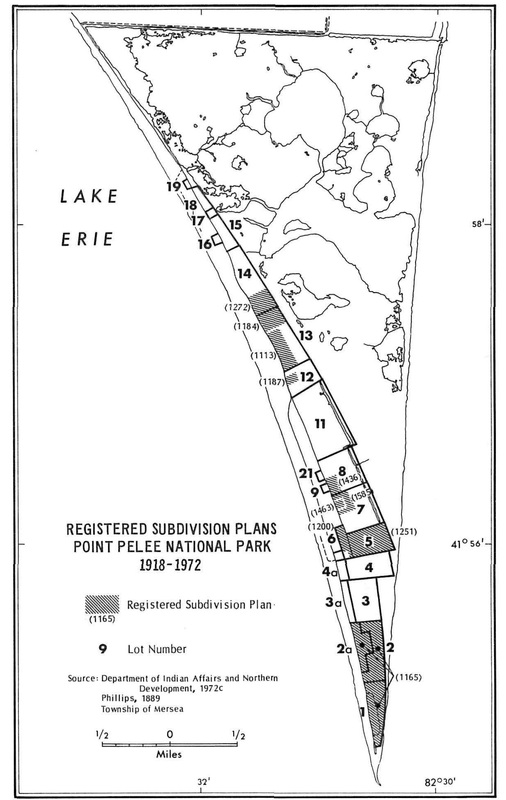 The entire shoreline of Point Pelee National Park (41°58', 82°32' ) is a spawning area (Environ. Can. 1977a). 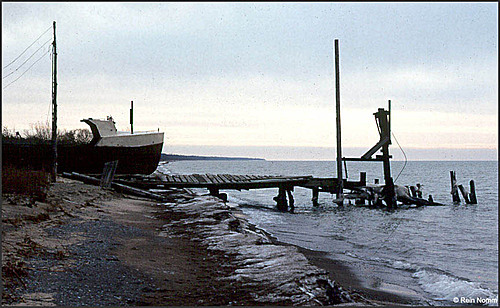 Until recently, large numbers of ripe walleyes moved onto the reefs off the point and onto the gravel and sand areas along the west shore (Julien 1967; Krause 1967; Tiessen 1967); by about 1950, these areas were degraded by domestic and cannery wastes from Leamington (42°01', 82°36') and neighboring towns (Regier et al. 1969). 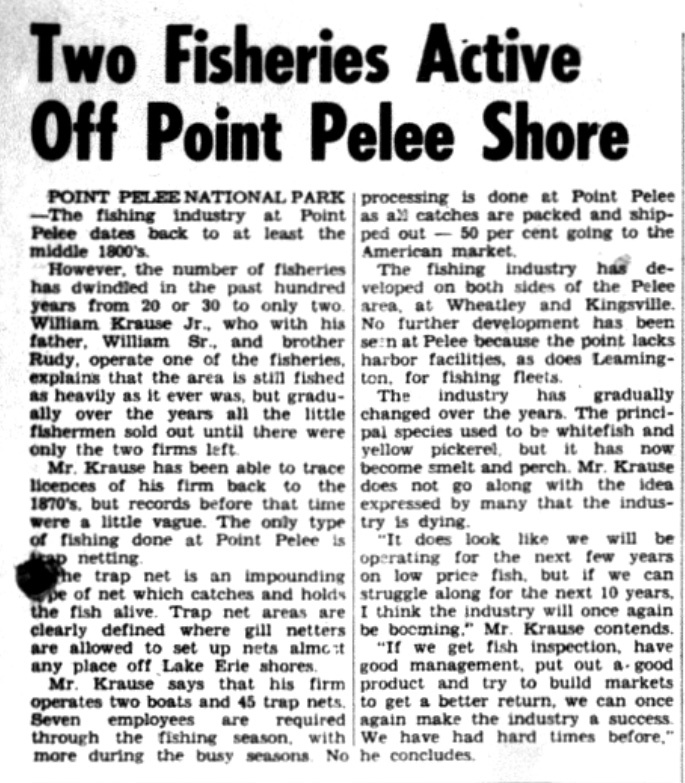 In the spring, adults were first taken by fishermen about 15 mi SE of Point Pelee; the fish then moved towards the shore areas of Pelee Island (41°47', 82°40') and Point Pelee (Krause 1967). 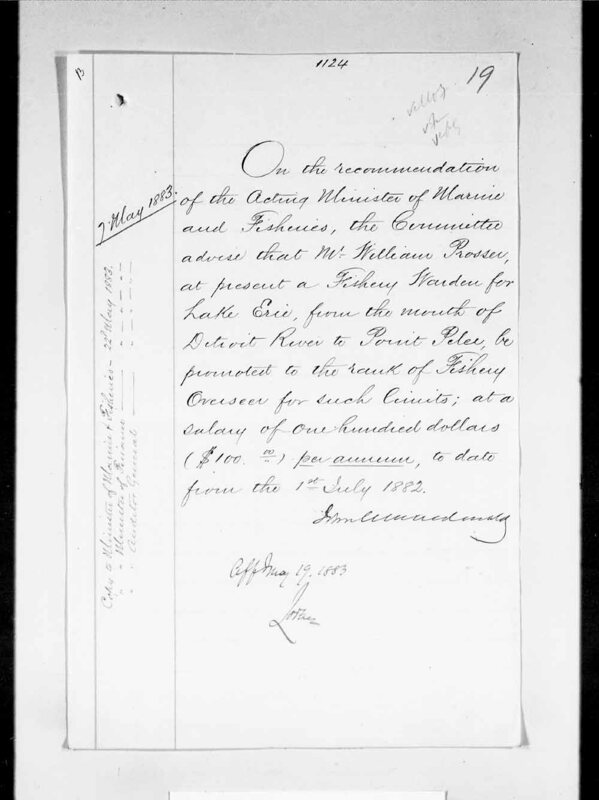 ... p. 183. Henrietta O'Neill, In Search of a Heart (Friends of Point Pelee, 2000), p. 27. The body of Jackson was found Monday morning on the west beach, near John Loop's fishery, about two miles west of the point. 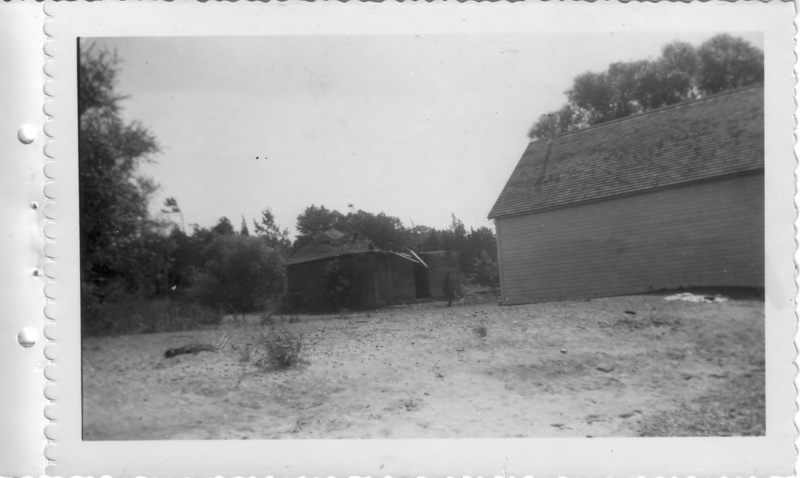 John Loop and William Setterington Fish Shanty and Log House, located on the west of Point Pelee. 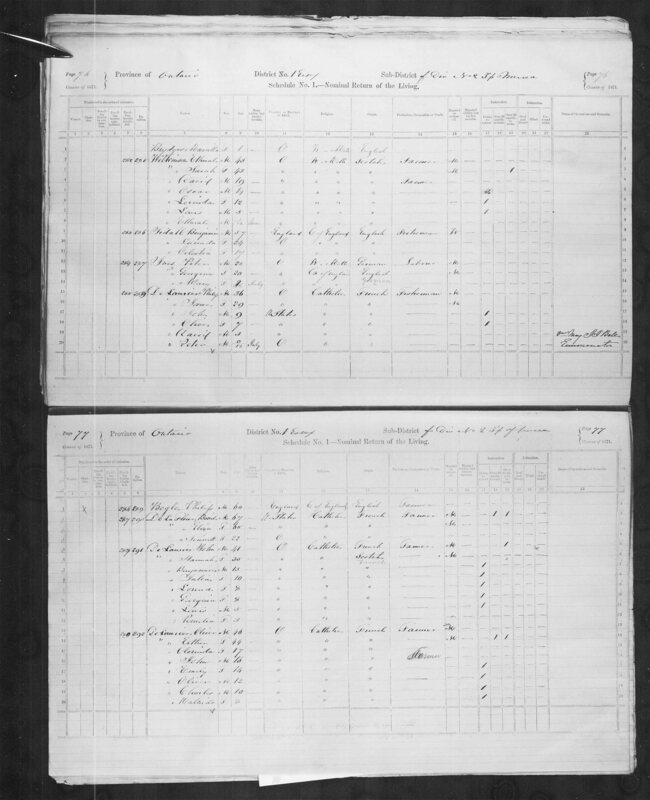 Loop Jr. and Loop Sr.
Philip Girardin sold his fishing rights to McLean. 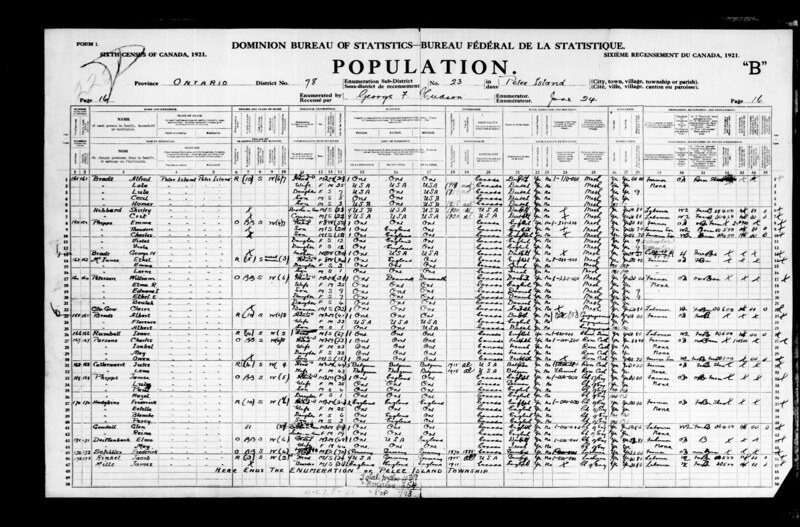 Future research: http://www.bgsu.edu/colleges/library/cac/ms/page43262.html - The Historical Collections of the Great Lakes - seven microfilm reels of records for the McLean Brothers Fisheries Company in Wheatley, Ontario - documents the activities of a Canadian Lake Erie fishing company for the years 1908-1960. 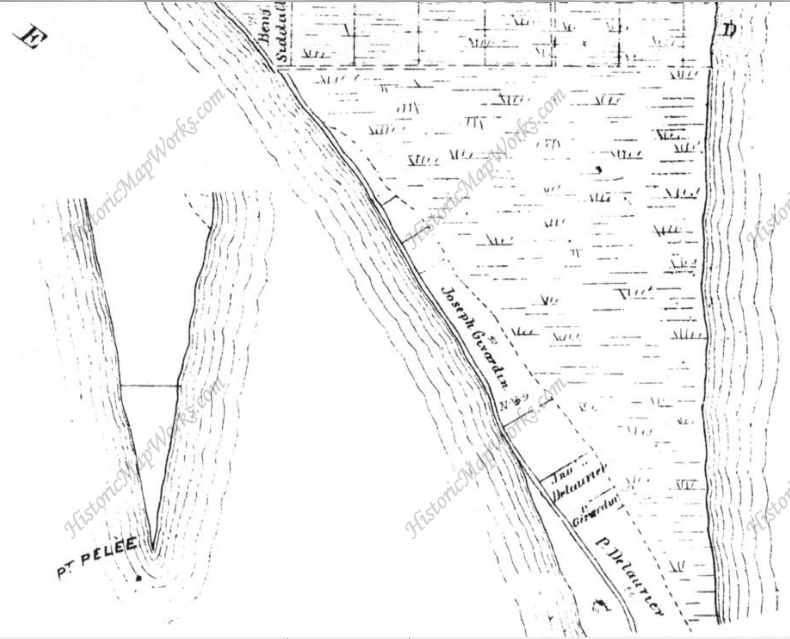 By now, the Federal Park was determined that no private property should remain in the area, but my husband [William Krause] was not about to sell the Fishery or our home. We went to court and since McLean who had been the original owner from whom it was purchased testified to that fact, the government lost the case and appealed it. 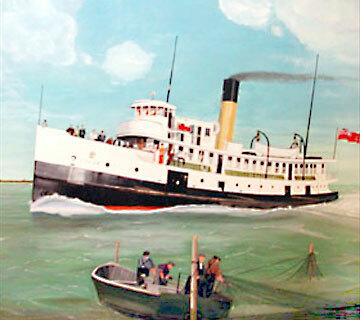 Harold "Mac" McClellan began fishing in the 1920's, when employed by James W. Grubb at Point Pelee. One experience, which he related, is still very clear to him and provides further proof that even the most experienced fishermen were often fooled by the weather and Lake Erie's unpredictable nature. The incident occurred on a Good Friday when the crew set out to drive stakes into the lake bed in preparation for the pound netting season. 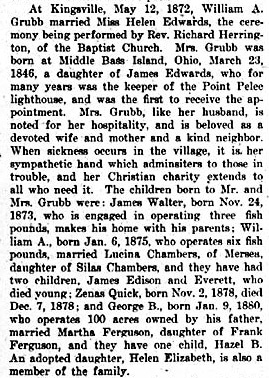 Jim Grubb had been rather dubious about going out on the lake on that particular day and was perhaps a little superstitious. With only a few stakes left to drive, the east wind suddenly changed into a "northwester". 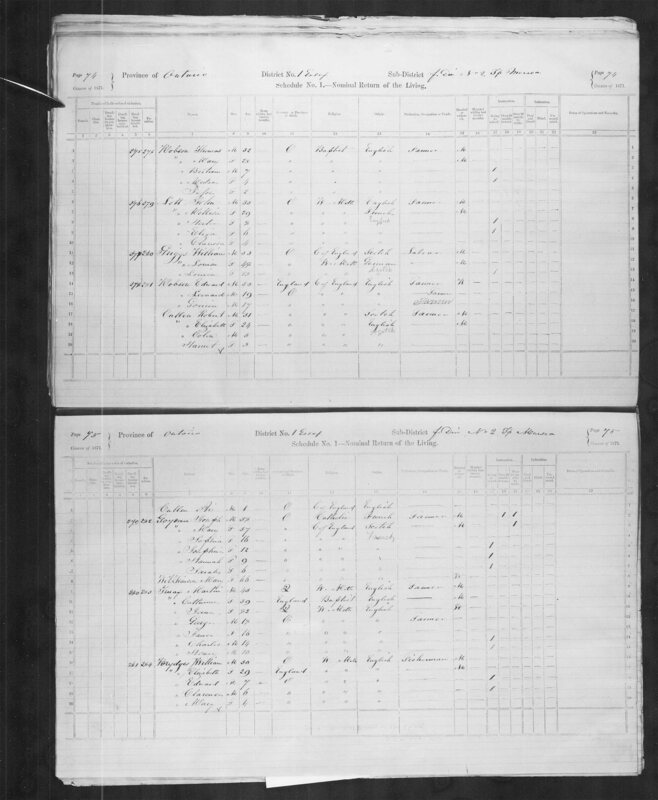 Rough seas made it too difficult to continue their work so the men decided to head for the shore, towing the scow with its men on board behind the boat. 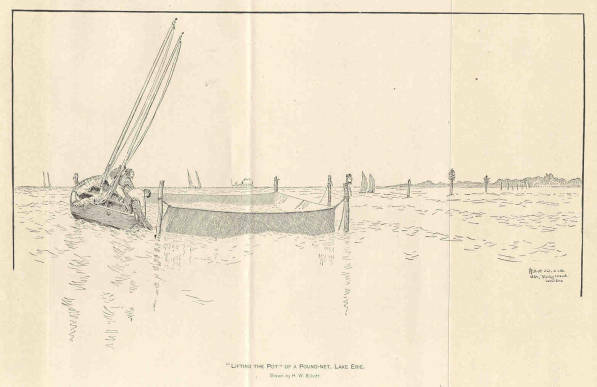 Several times the tow line broke, forcing the men to abandon the scow and board the open wooden boat. By continuously bailing water they were able to reach the shore where their anxious wives were waiting. 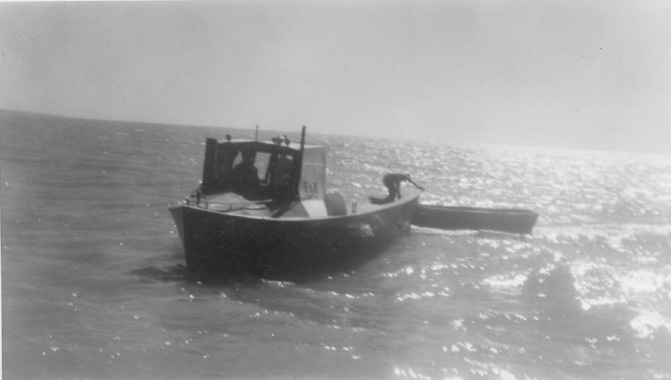 The abandoned scow was struck by a freighter, but was later salvaged when other fishing tugs towed it in to shore. 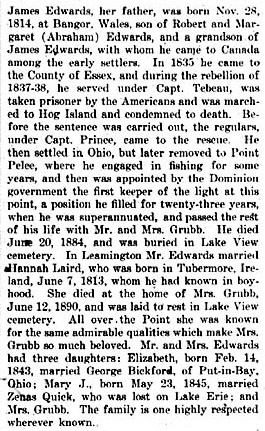 "Mae worked for a number of years at the Grubb fishery and was also a member of the Point Pelee Volunteer Rescue Squad, which saved many lives during Its years of service. The dramatic rescue of the victims on the boats. the "N. J . Nessen" and the "Kelly's Island", are but two of the many rescue missions carried out by these brave men. 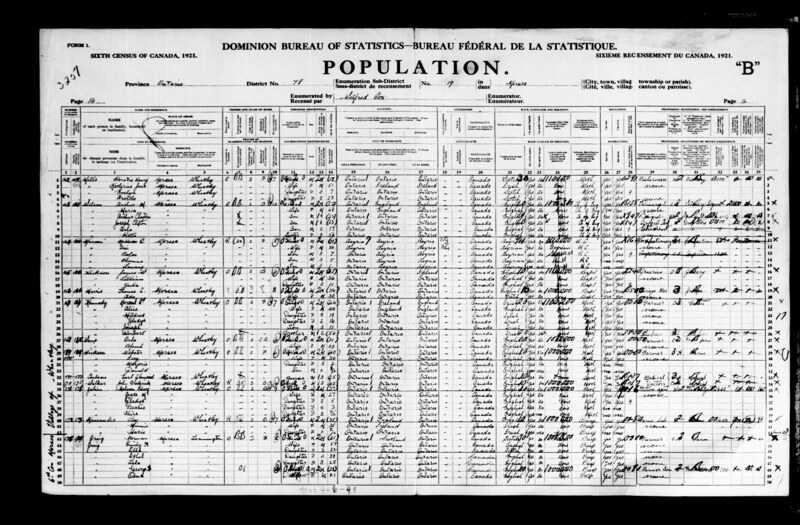 Olmstead bought Goldbaum license but never used the buildings. 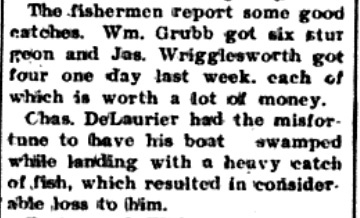 In June 1898 Adam Oper was a well-known Point Pelee fisherman. William Grubb will operate Capt. Post's fishery on the east beach this summer, it is said. He will be assisted by Ned Cassidy. 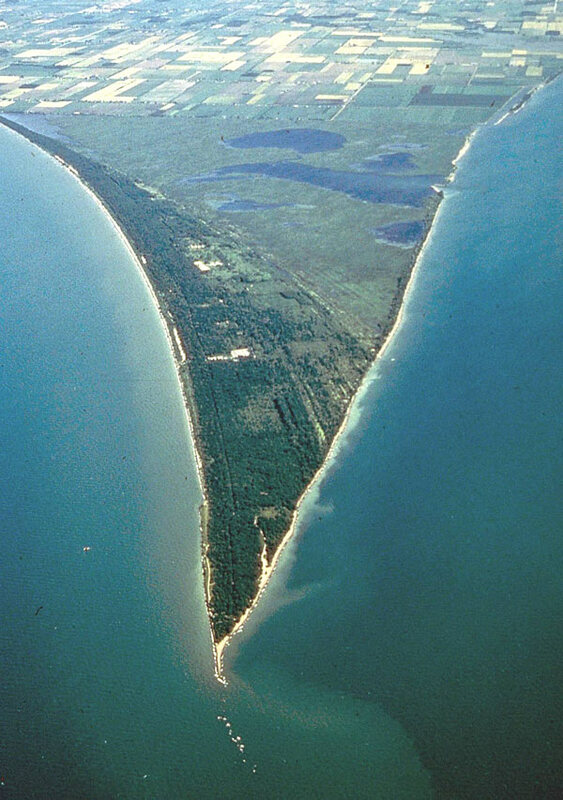 POINT PELEE PARK TO BE ENLARGED ... GOVERNMENT ACQUIRES JOE POST PROPERTY ... ABOUT 178 ACRES ... On the premises there is a concrete block house, another large house and other farm buildings ... 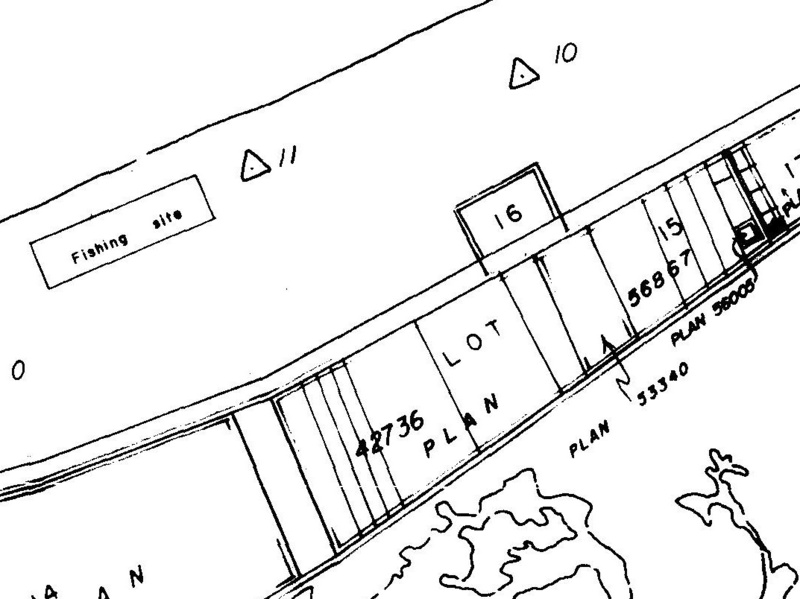 The Post property is located on the east side of the point, and runs almost to the extreme southerly limit ..."
Leita Girardin sold the fishing rights in 1962 to Ribble and Grubb who operated north of the Parks gates until the death of Riel [Rile] Grubb in 1972. 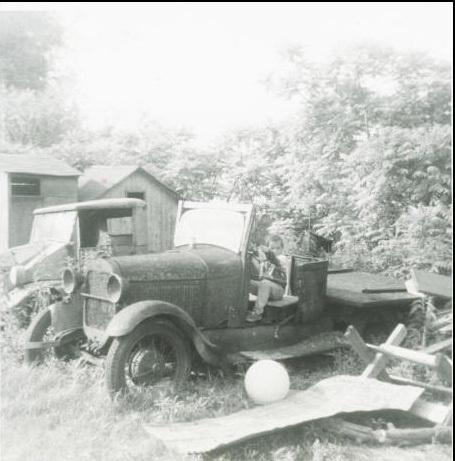 "Mark Ribble circa 1966 sitting in the 1927 Model A that was used by Ribble & Grubb Fisheries for tarring nets. The fishery property was located about 300 metres south of the Boardwalk on the same side of the road. " 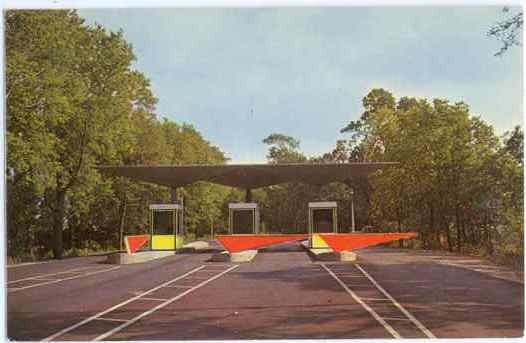 This would have been located just inside the gates on the lake side of the road, probably just before where the parking lot/orientation display is now. As with most people of my generation, I remember during my early years, wondering aloud what life would be like as an adult, what the year 2000 would bring and what I’d be doing when I was 50 years old. That seemed like a lifetime ago, and it practically was. 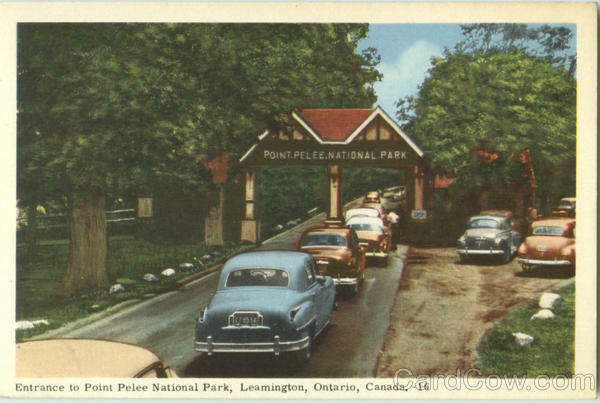 As a kid, I’d spend my summers running around bare - foot at our place at Point Pelee with friends Steven Mail - loux and Jimmy Reid, who both came from Windsor to spend the summers at cottages that were on our property. Danielle Mellian lived next door. Her and I used to talk about what we wanted to be when we grew up. I think she wanted to be a nurse. Although it seemed a foregone conclusion that I was going to be a fisherman, it never did materialize. 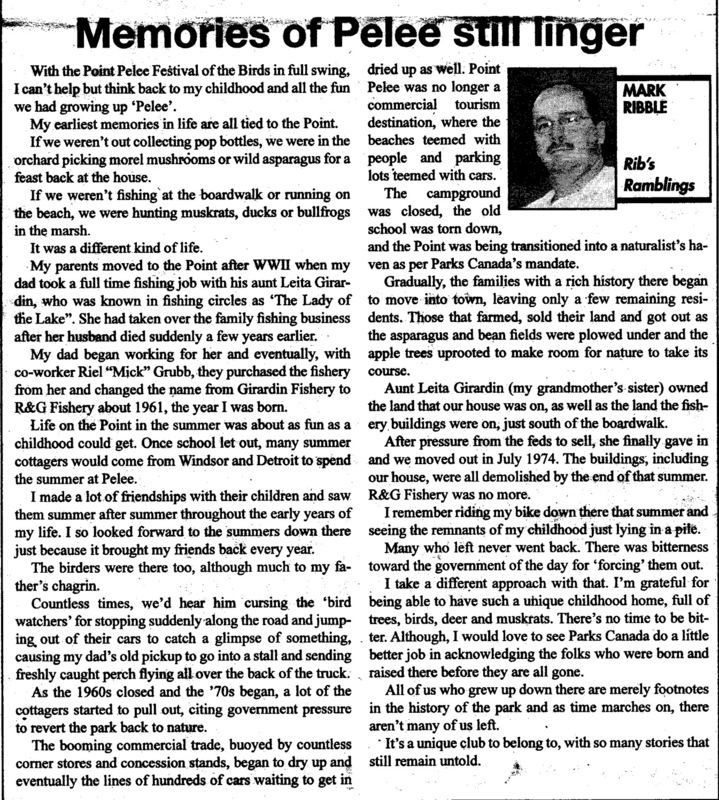 I worked a couple of summers at Krause Fisheries [then no longer at Point Pelee but operating out of nearby Sturgeon Creek] in the late seventies, but that didn’t turn into a career for me. I had this interest in being a fireman early on, which was spurred by our occasional make-believe games on the R&G Fishery property. Behind the fishery’s main building, which we referred to as the ‘Fish House’, was a pile of rubber boots, rubber raincoats and rain hats that somewhat resembled fireman’s gear. It was actually the rain gear that my dad and his crew wore during inclement weather on good old Lake Erie. 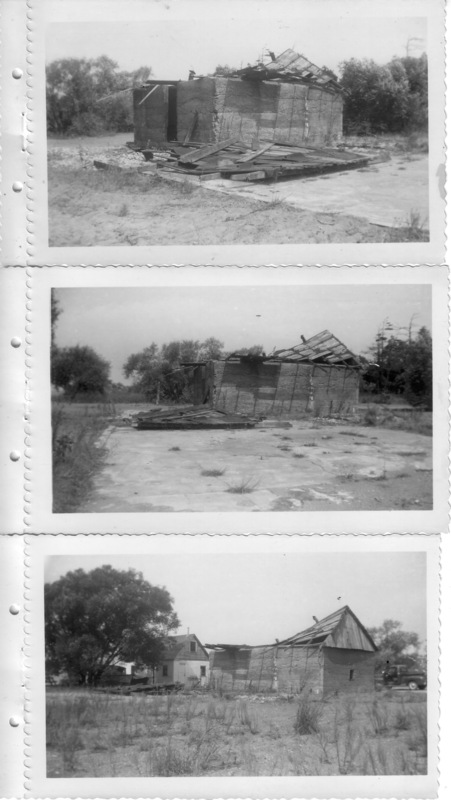 We’d often find an old hose and pretend we were put - ting out fires around the ‘tar vat’ which sat behind the fish house. 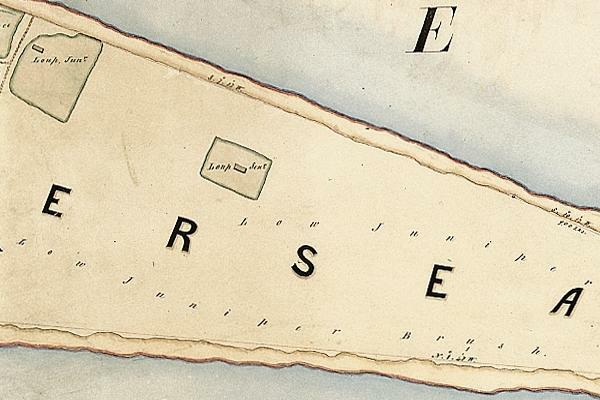 The tar vat was a very interesting piece of history itself. Nowadays, you wouldn’t be able to store tar anywhere in the open, without having a fence around it and umpteen dozen padlocks on the fence. There would be WHMIS sheets everywhere. Back then, the large square metal container sat right out in the open and held hundreds of gallons of black tar that could be heated into a bubbling liquid. The fishing trap nets were tarred every year to prevent them rotting from being in the lake for the whole season. Two or three days before the tarring was to take place, the heater was turned on, which transformed the vat of solid black into hot liquid tar. I still remember the smell and can’t pass by a road paving crew today without inhaling a nose full and reminiscing about the smell that I always considered one of the more favourable smells from my childhood. It sure beat the heck out of fish guts and muskrat pelts, which were common smells of my childhood. On tarring day, us kids would gather around to watch the guys do their magic with the tar. One-by-one, the nets were loaded onto a pallet-like platform and lowered from an overhead winch and pulley into the vat of hot tar. I can’t remember how long they left them in there but it was fun to watch them lift the nets out of the tar and load them onto the back of the old Model A. 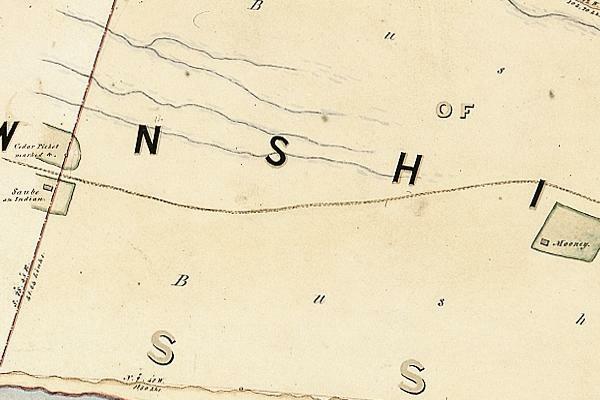 After the fishing season was over in the fall, the nets were ‘pulled’ and brought into the ‘twine shanty’ for repairs. A small crew stayed on for the winter months to mend the nets by hand with a spool of nylon twine in one hand and a plastic or wooden twine needle in the other. The smell of tar dust filled the air and your nostrils. After you were in there for a few hours, you’d blow your nose and all of that black dust would come out onto the Kleenex, or in those days, your handkerchief. I’m surprised we all survived that but we did. The bounty of Lake Erie back then usually included yellow perch, pickerel, silver bass, carp, sheephead and mullets (suckers) with plenty of catfish thrown in. They threw back the garbage fish, the ones my dad called sawbellies and ale - wives. Although I didn’t often get to tag along on the fishing boat, I did go out a few times on nice days. 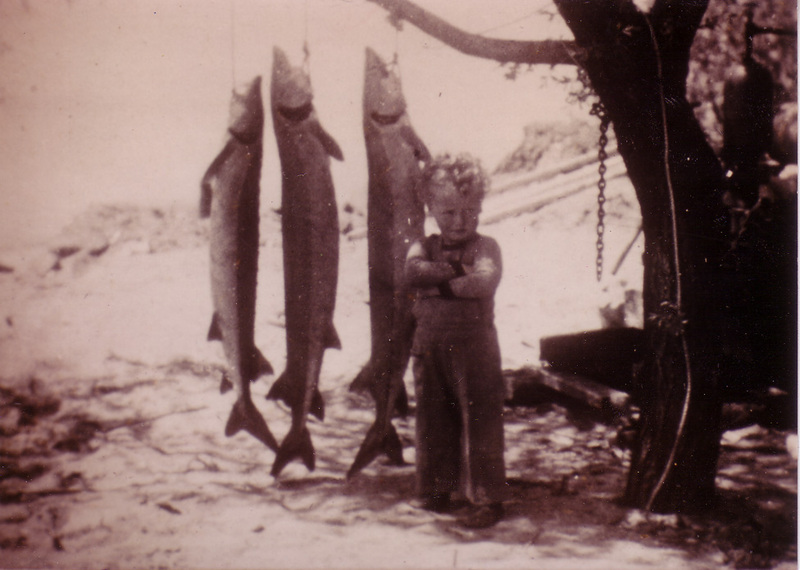 Being the youngest child, I came along toward the end of my dad’s active fishing career. However, I learned a lot about hard work, the lake and its fish. As a kid, I could tell you what a Buffalo Carp looked like and if someone asked me to describe a mud-pout, I could do that. I can still look at a catfish and tell you if it is a channel cat or a bullhead. In the spring, the smelters would arrive at the park in droves, armed with seine nets of all kinds, waders and tin garbage cans. It took just a few dips along the shore to get those cans teeming with the silvery Lake Erie delicacies. We would stay open late at R&G Fishery to sell smelt to those who were unlucky or too impatient to wait for a spot on the beach to open up. We sold smelt ‘on the whole’ or dressed, late into the evening, as long as cars were still driving in and out of the park. 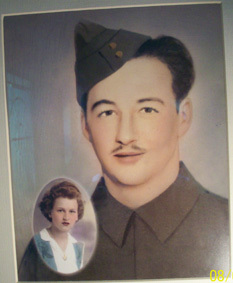 It was all part of life, growing up ‘Pelee’. All of this is stuff that I miss when I think of my childhood. I’m sure we all have fond memories of the things we used to do as a kid. Our kids and grandkids will have memories to pass on as well. They won’t be memories of tar dust or smelt fishing, but they will be memories nonetheless. The fishermen of Point Pelee started operations last week in the Setterington and Campbell Fishery. 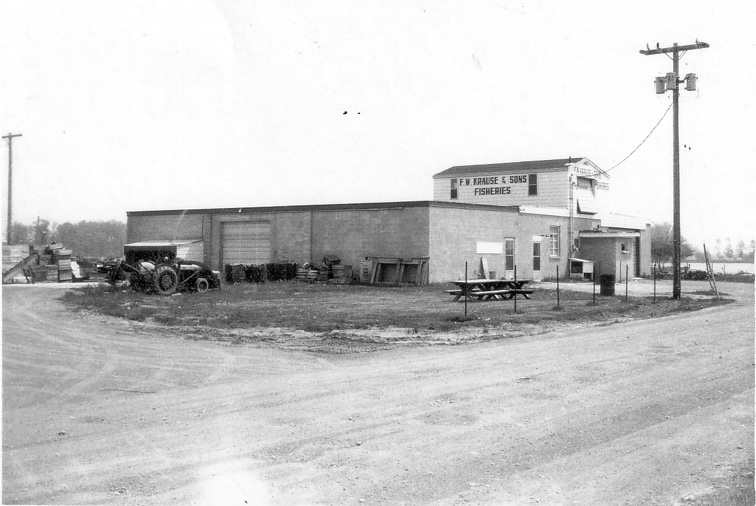 Karl Rudy Krause recalls that his father first purchased the license of McLellan and then further north that of Sid Tilbury where they operated their Fishery until 1969. 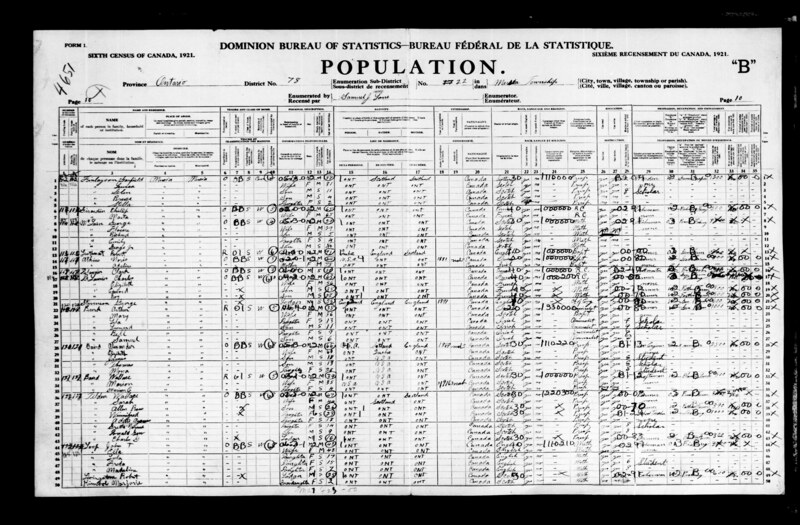 Sidney Tilbury, age 17, according to the 1911 Census was living with the Thomas Wigle family in Essex South, 17 Gosfield South, was single, a Thomas John Barnardo Home Boy, from England, born in July 1893 who arrived in 1902 and was a laborer. 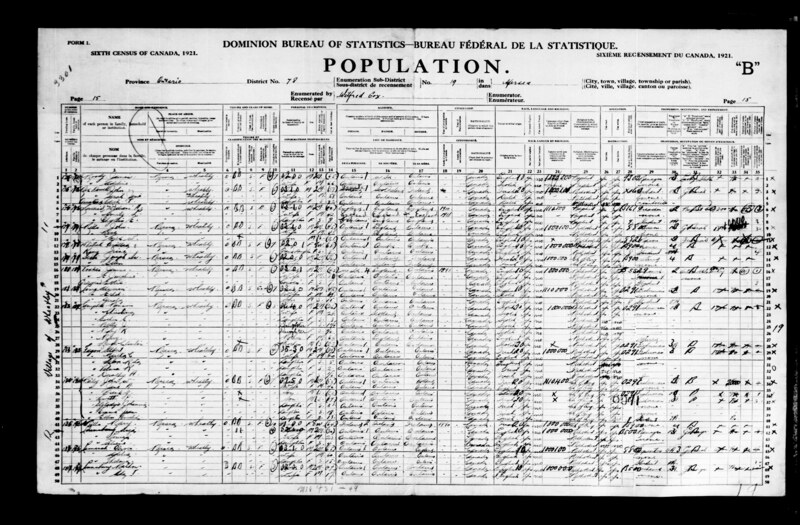 In 1901, a home child, named Sidney Tilbury, age 10, arrived in Dr. Barnardo's party, in Quebec. 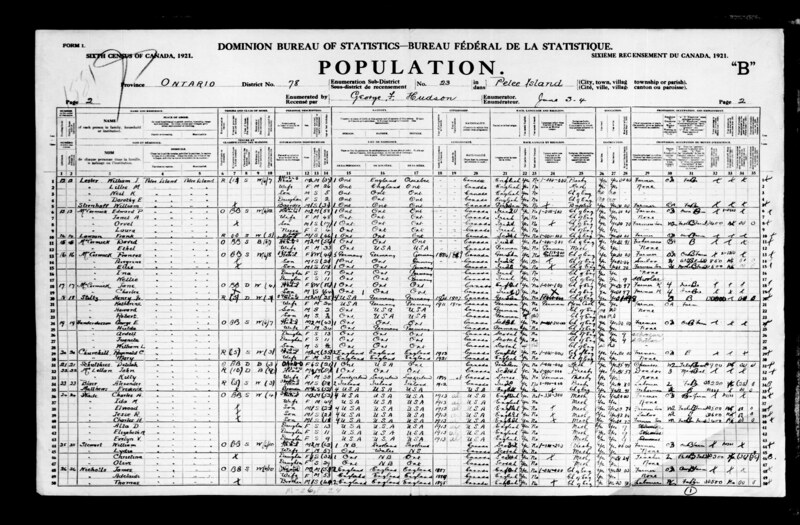 Accordingly, 239 went to Toronto, 68 went to Winnipeg, 20 went to Russell, Manitoba and 3 went to Peterborough, Ontario.